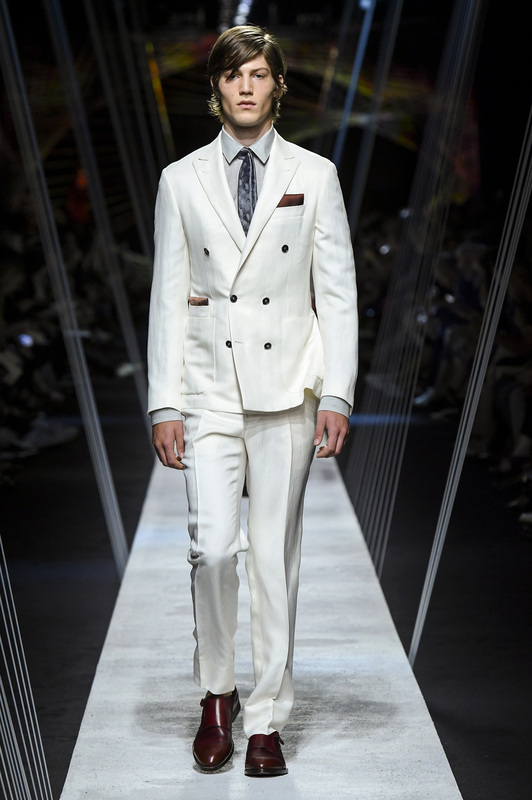 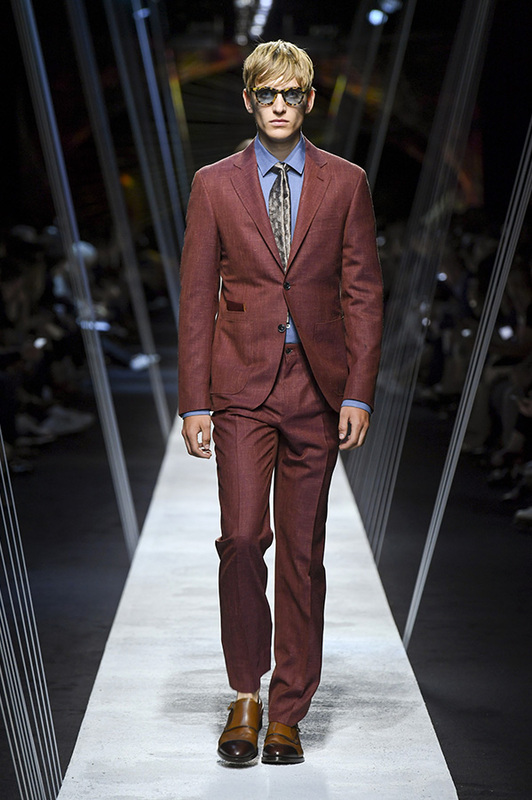 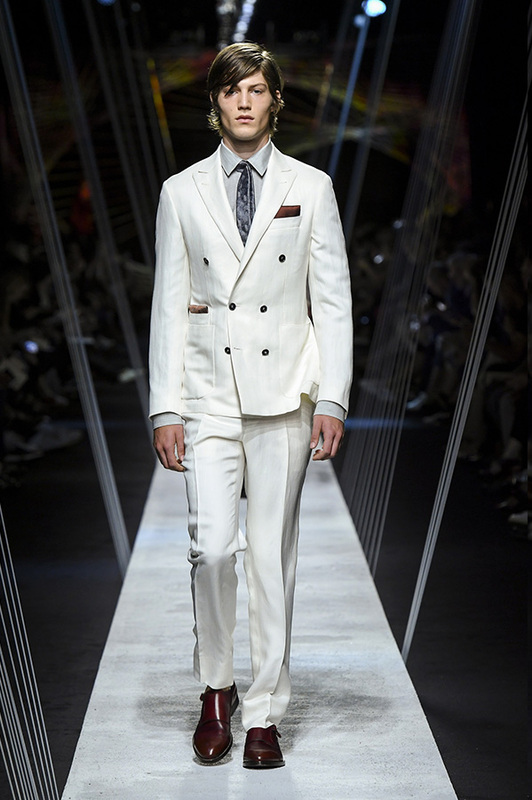 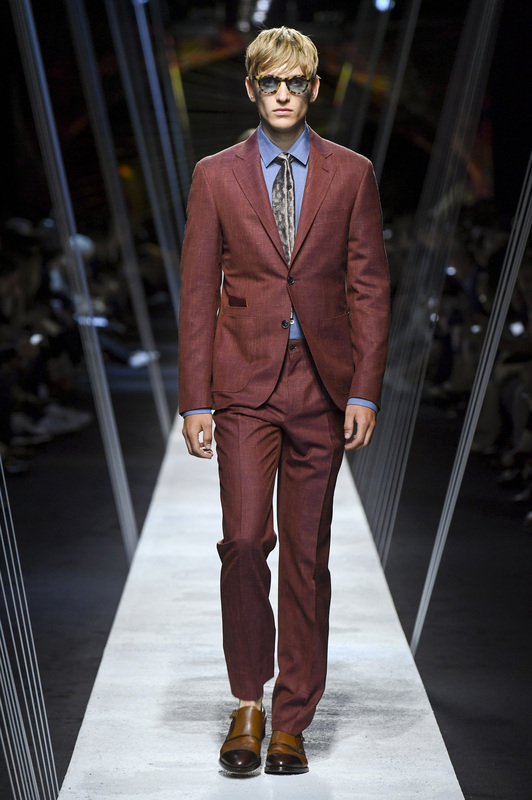 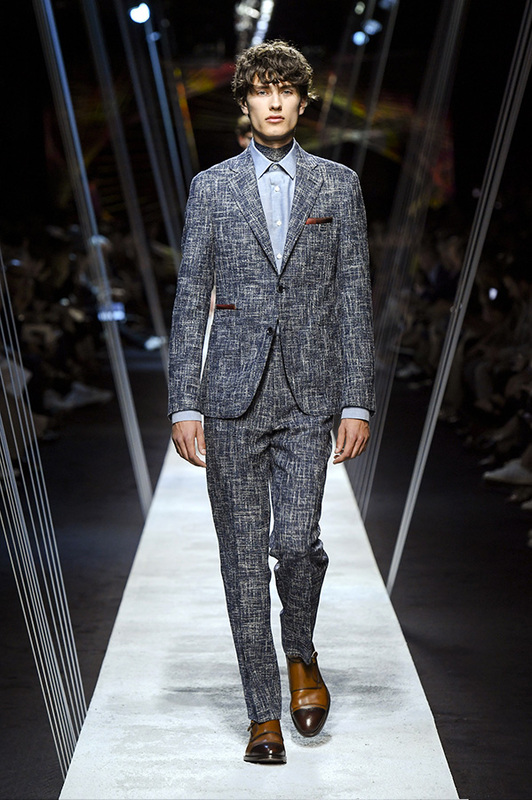 Kei suit consisting of double-breasted jacket with peak lapels and phone pocket and flat front pants in malfilé fabric, cotton muslin shirt with butterfly print, suede single monk strap shoe with contrasting toe cap. 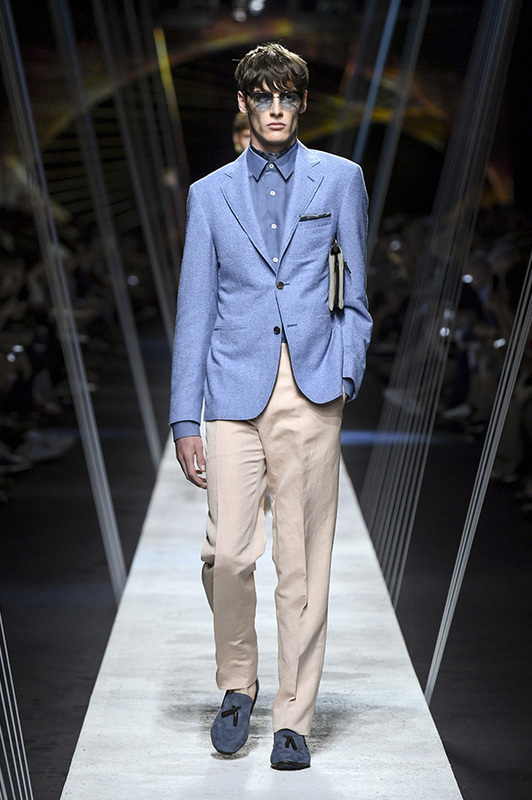 Linen-silk Kei suit consisting of jacket with phone pocket and pants with two reverse pleats, linen-cotton mélange shirt, silk pocket square, neck scarf used as tie, belt bag with retractable handle, nubuck loafers with contrasting band. 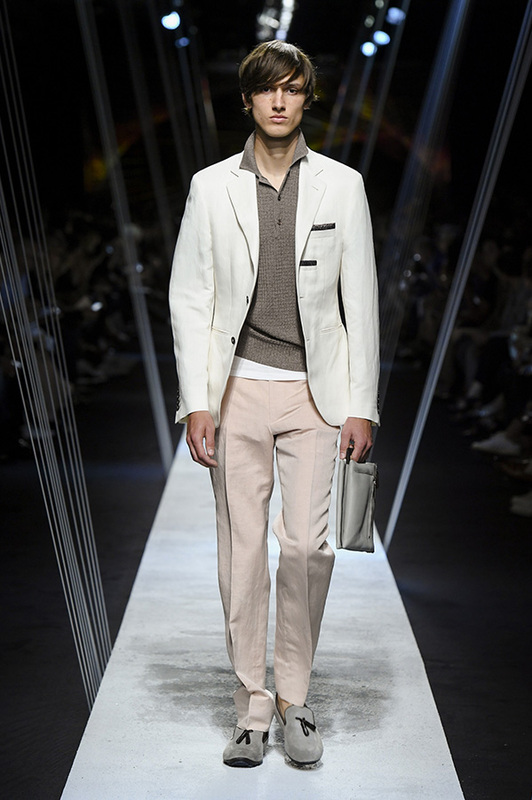 Micro terry effect jacket with double chest pocket, linen-cotton mélange shirt, pants with slant pockets, silk pocket square, silk scarf, tumbled calfskin pouch with retractable handle, loafers with tassels. 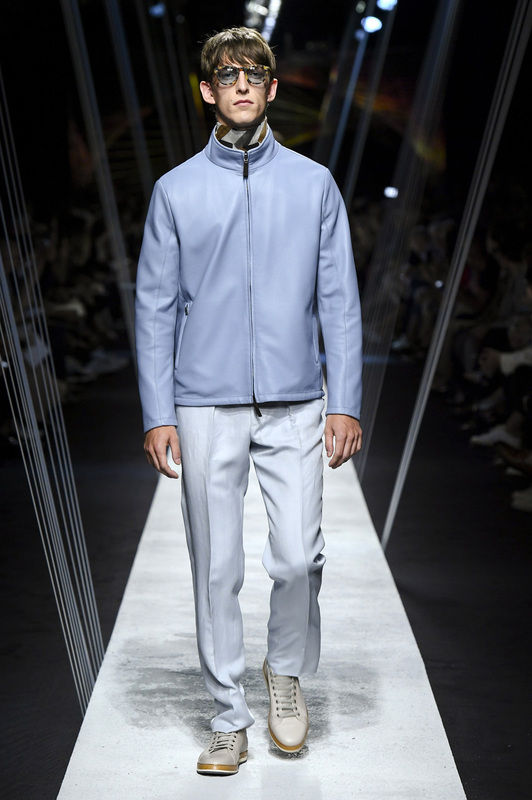 Soft sheepskin field jacket, mercerized cotton T-shirt, single-pleated pants, cotton-linen gauze neck scarf, carryall with retractable handle, perforated calfskin sneakers. 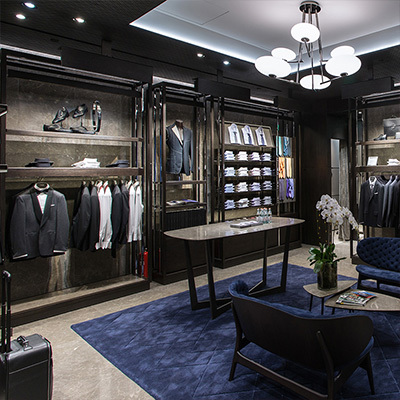 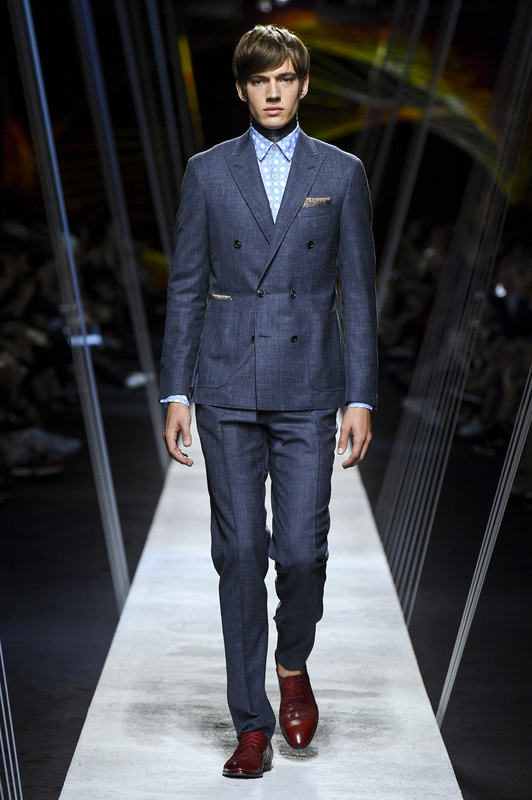 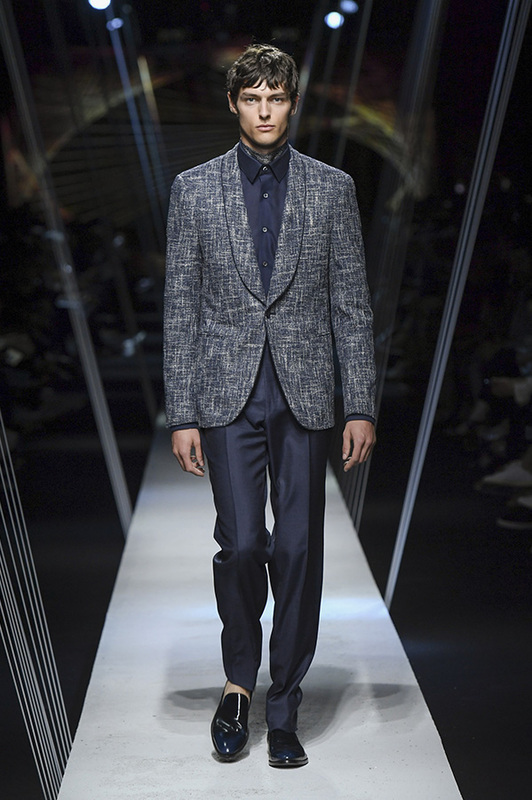 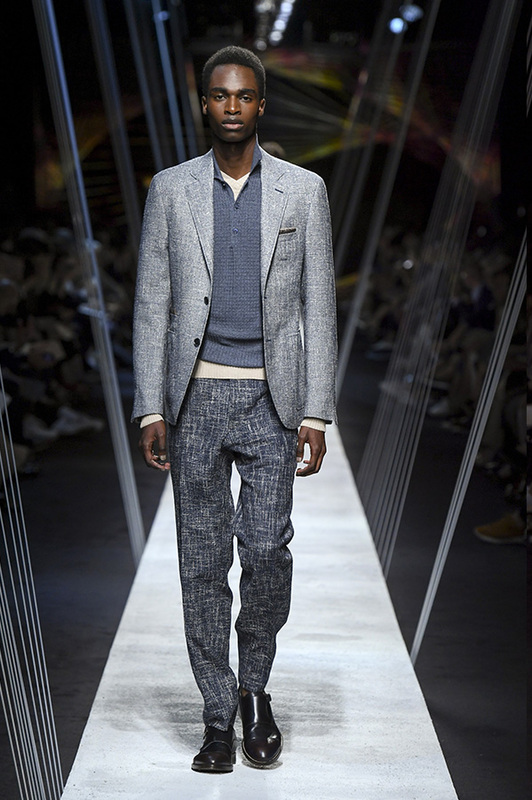 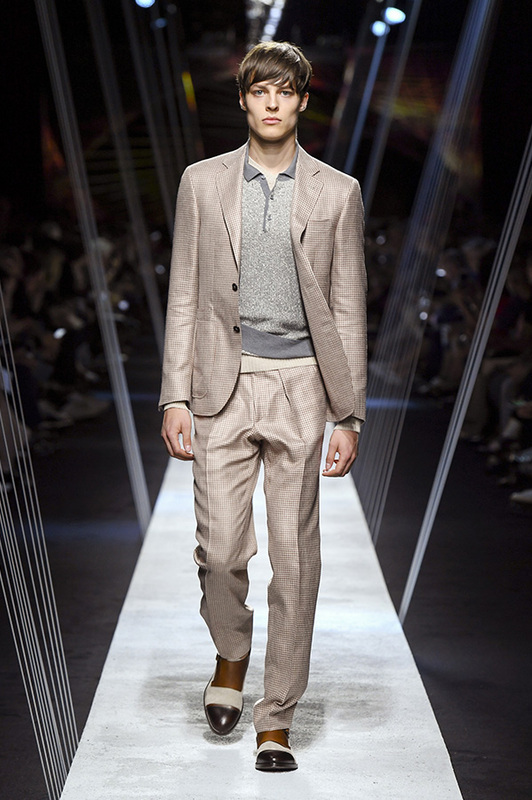 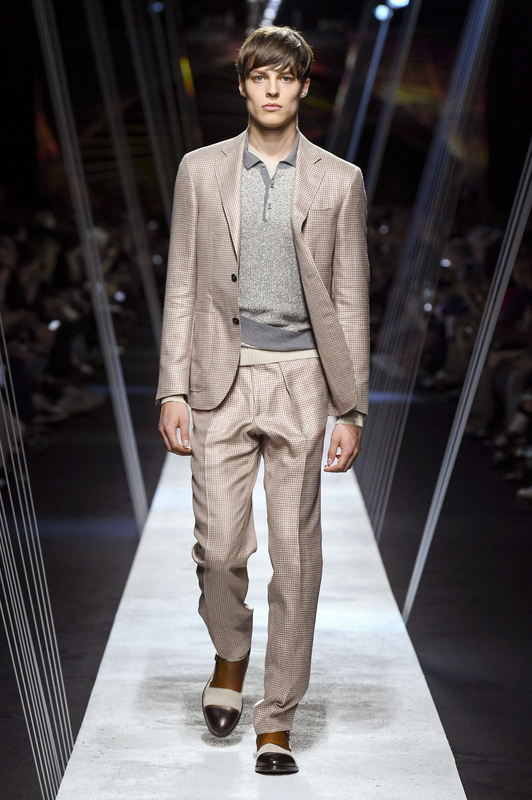 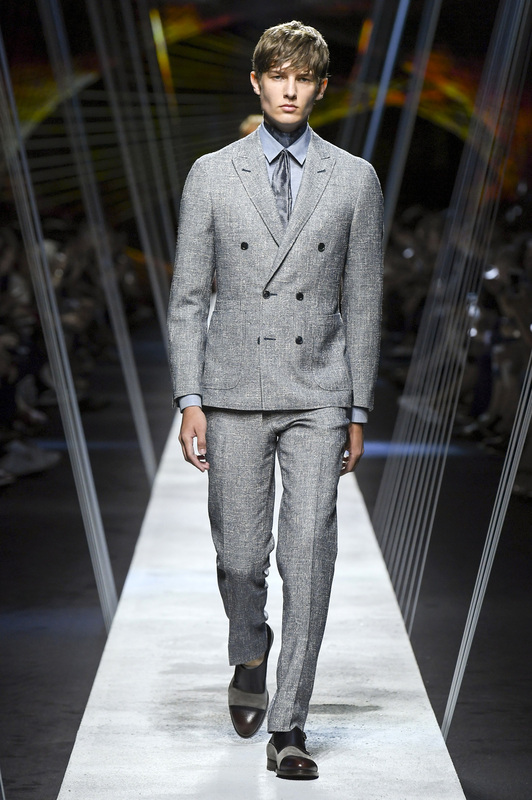 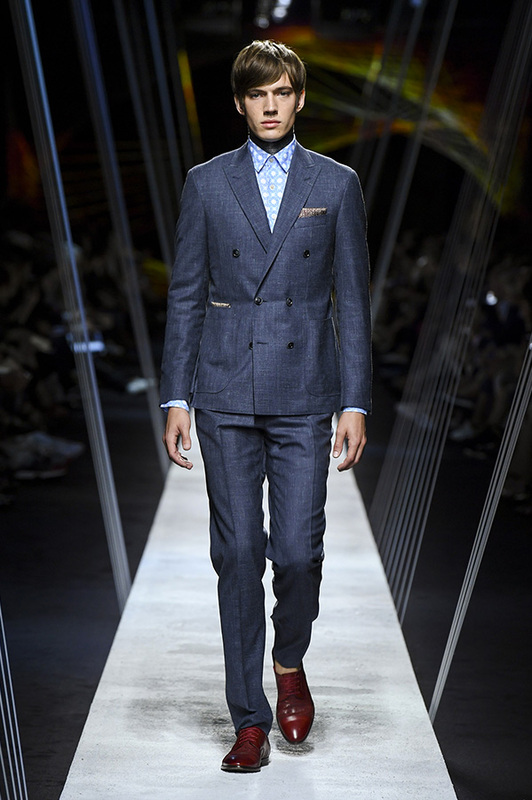 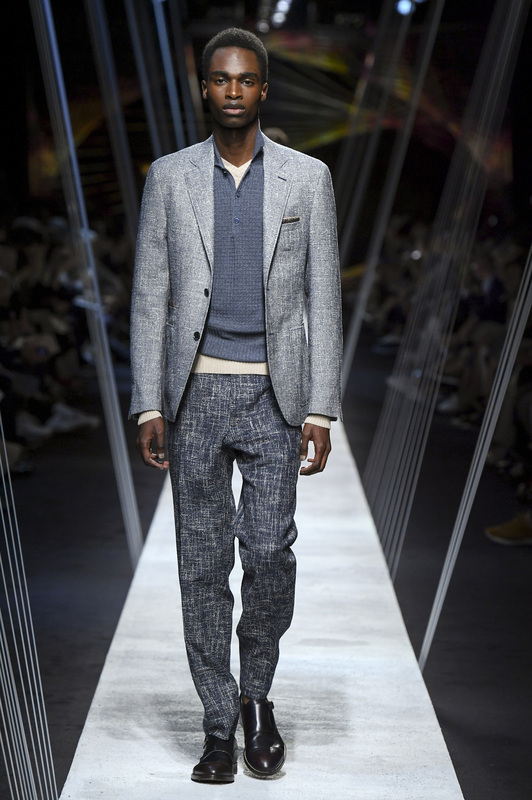 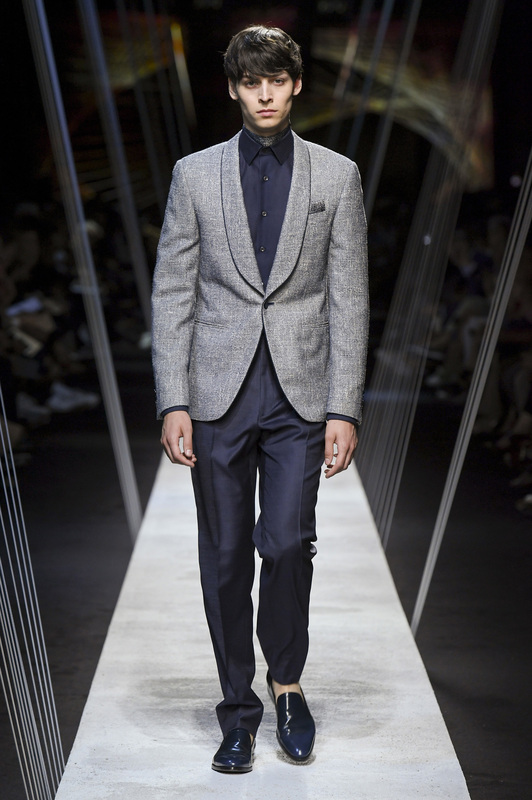 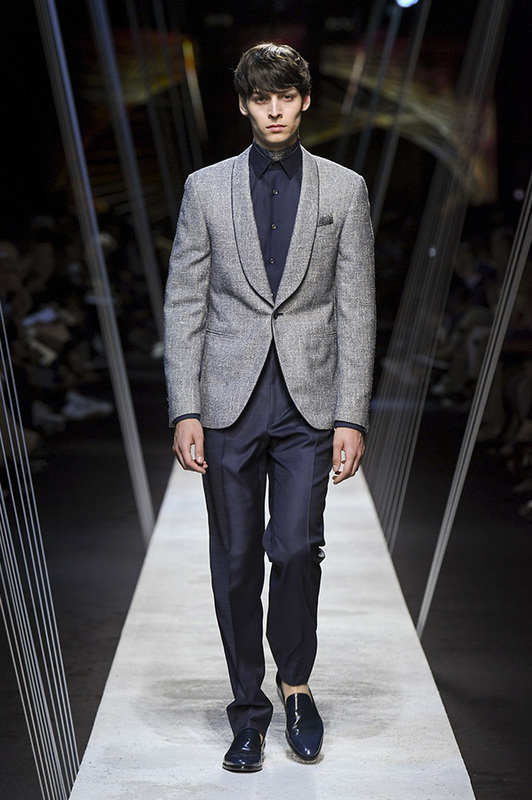 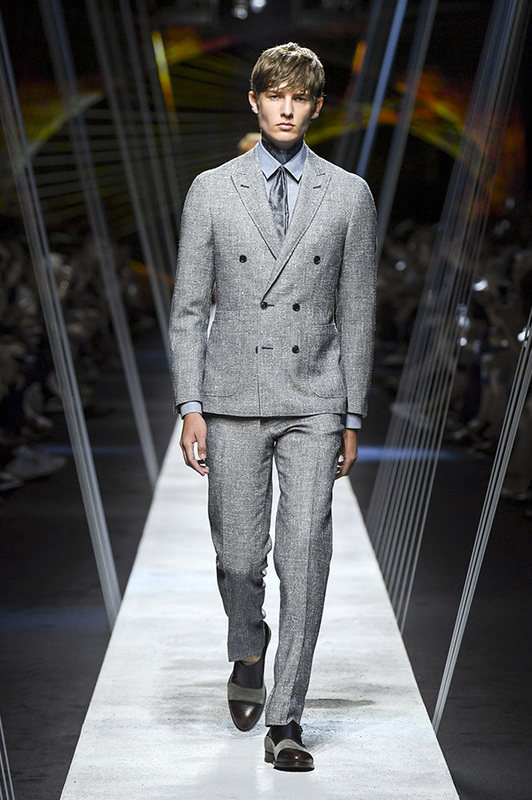 Houndstooth Kei suit consisting of jacket with phone pocket and pants with two reverse pleats, two-tone jacquard polo shirt, cotton sweater, suede monk strap shoes with contrasting toe cap. 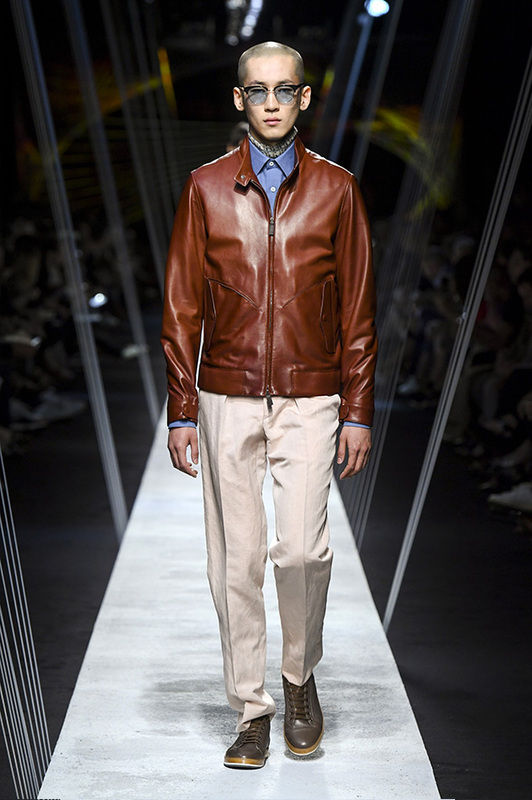 Reversible leather and cotton-silk piqué jacket, pants with two reverse pleats, cotton-linen gauze neck scarf, nubuck leather loafers with contrasting band. 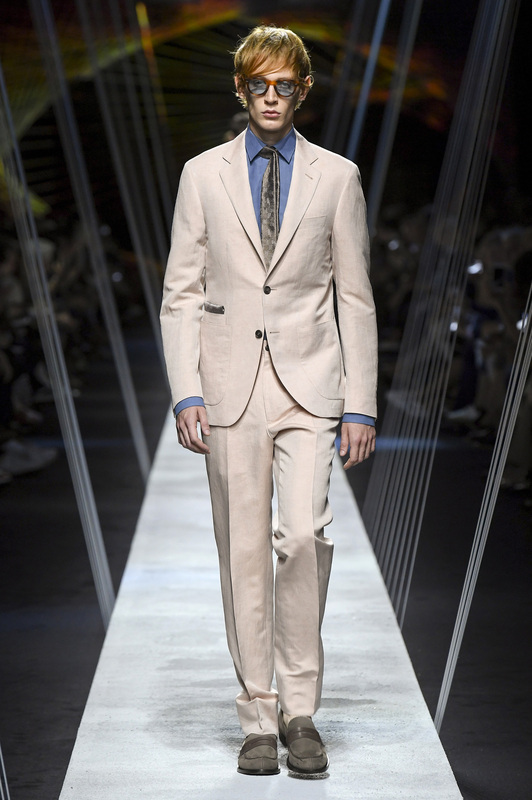 Wool-silk-linen Kei suit - jacket with phone pocket and pants with two reverse pleats, linen-cotton shirt, neck scarf used as tie, monk strap shoes with contrasting toe cap. 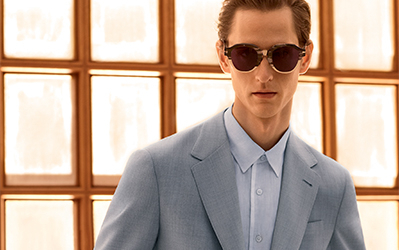 Linen-silk jacket with double chest pocket, cotton polo shirt, pants with slant pockets, silk pocket square, cotton gauze neck scarf, belt bag with retractable handle, loafers with tassels. 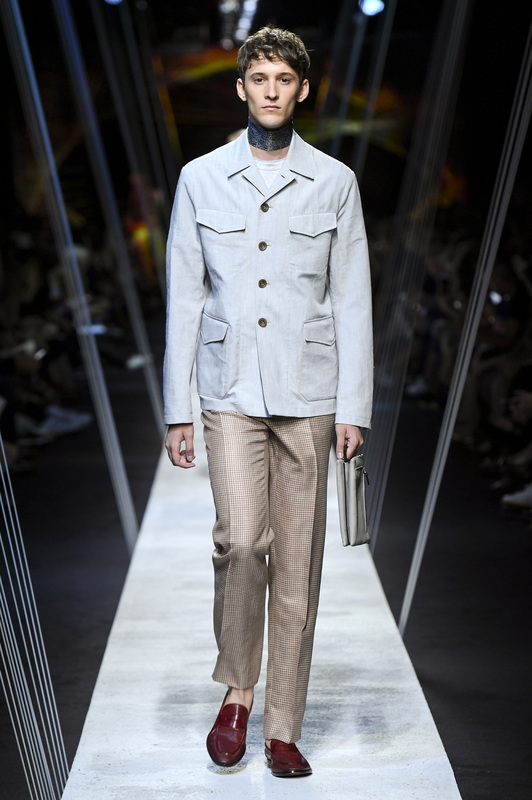 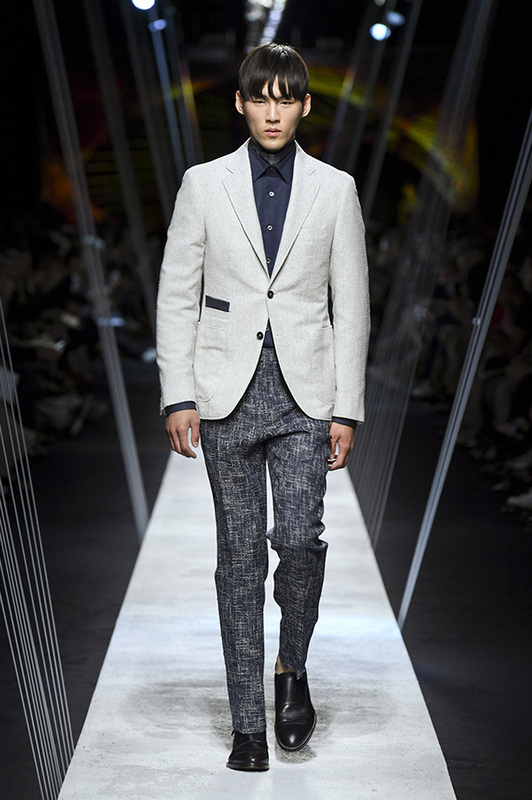 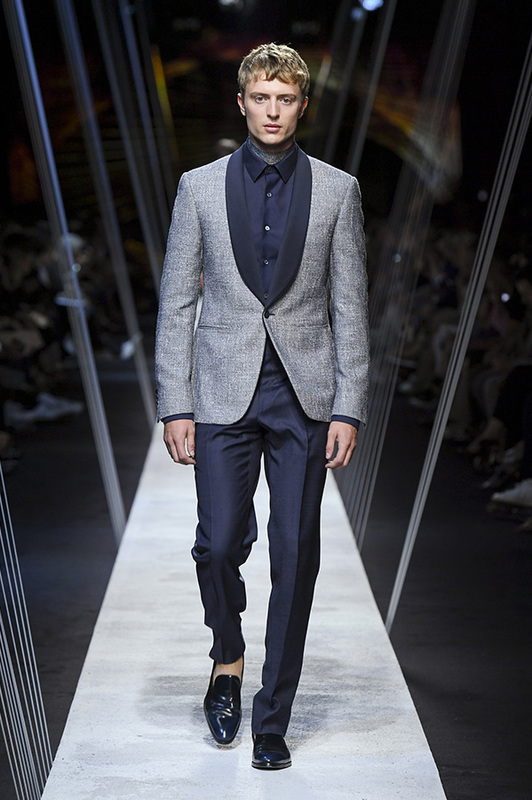 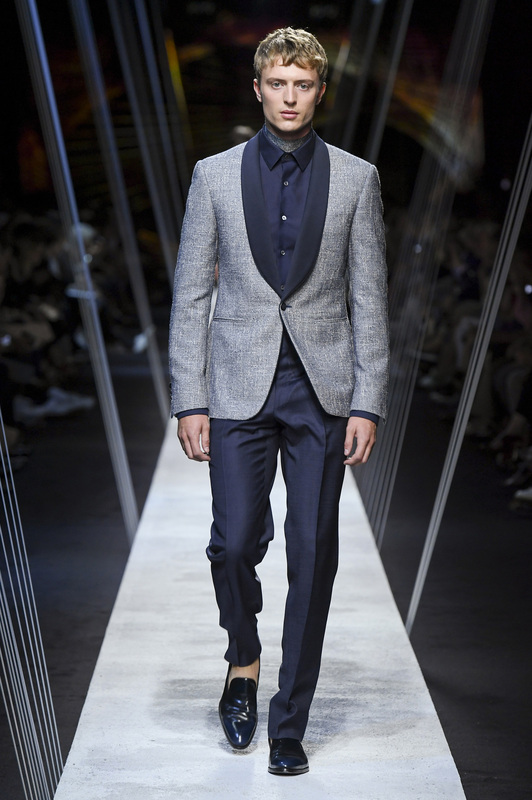 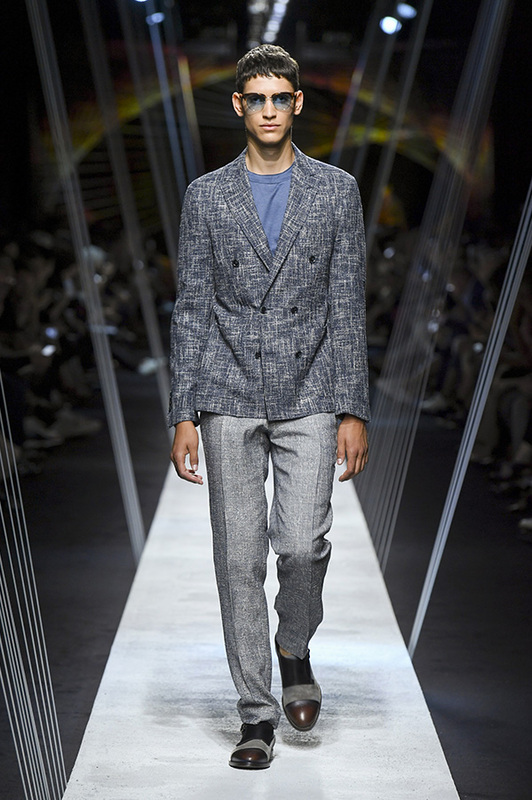 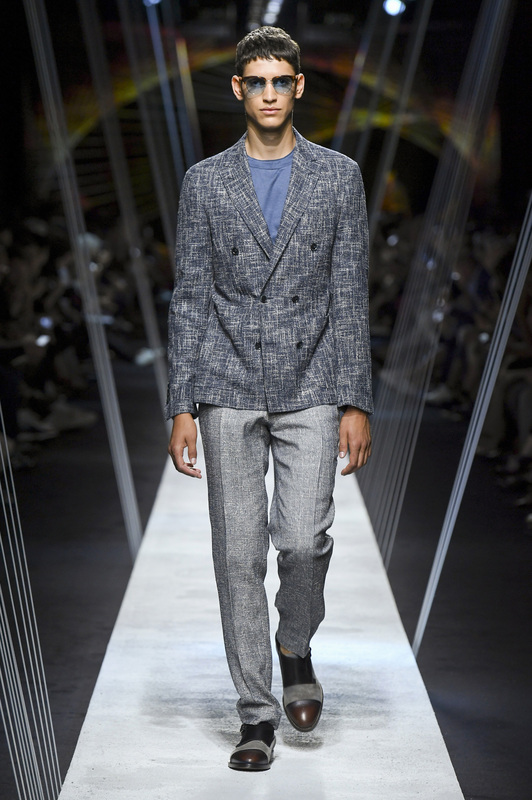 Double-breasted blazer in malfilé fabric with mobile phone pocket, mercerized cotton T-shirt, mouliné effect pants, suede monk strap shoes with contrasting toe cap. 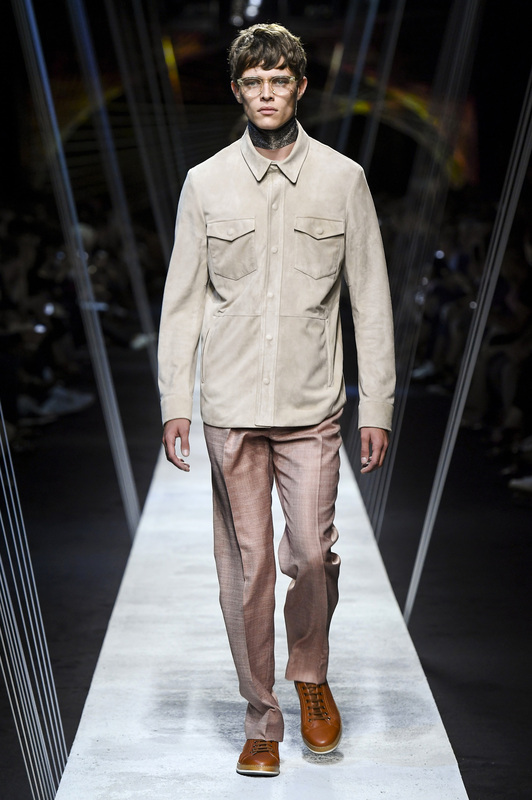 Goatskin overshirt with hidden closure, mercerized cotton T-shirt, pants with two reverse pleats, silk scarf, perforated leather sneakers. 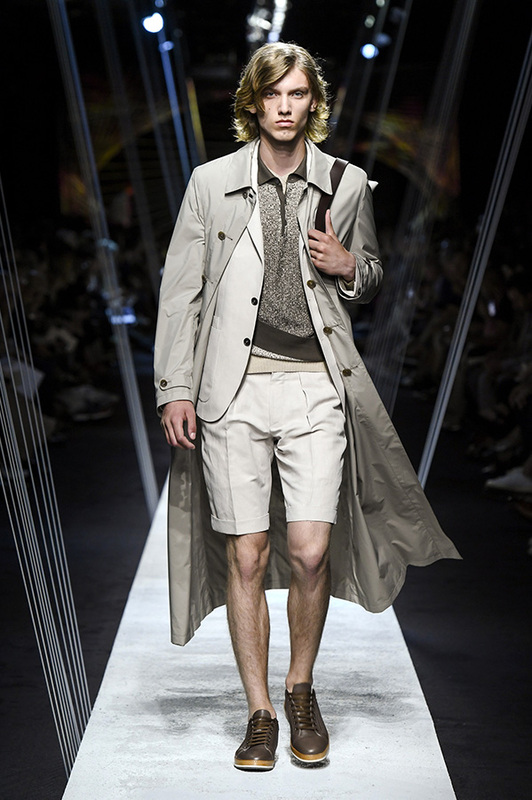 Reversible trench coat with toggle button at cuffs, mercerized cotton T-shirt, marble-effect jacquard sweater, linen-silk Bermuda shorts, belt bag with retractable handle, perforated leather sneakers. 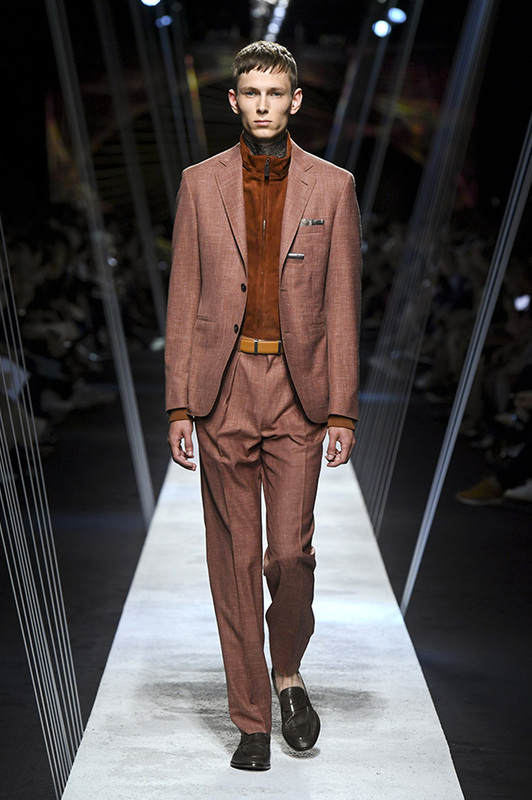 Kei suit consisting of double-breasted jacket with peak lapels and phone pocket and flat front pants, linen-cotton mélange shirt, neck scarf used as tie, silk scarf, leather single monk strap shoes. 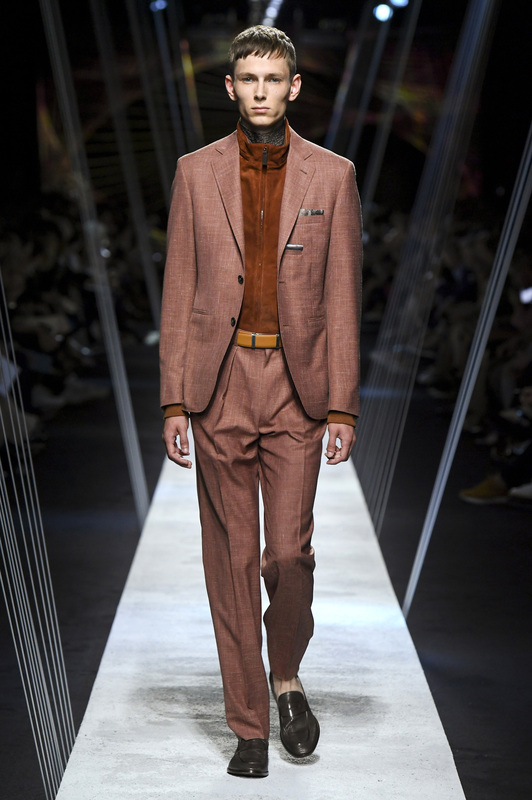 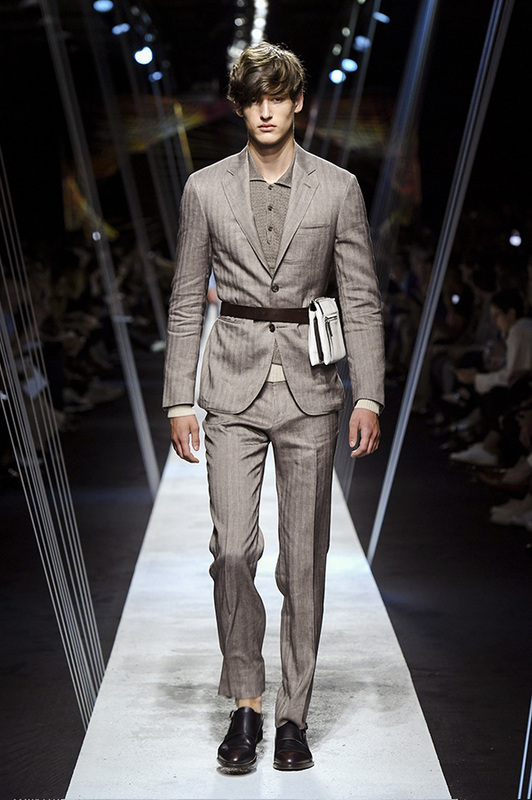 Herringbone Kei suit consisting of jacket with double pocket and flat front pants, belt bag with retractable handle, calfskin monk strap shoes with contrasting toe cap. 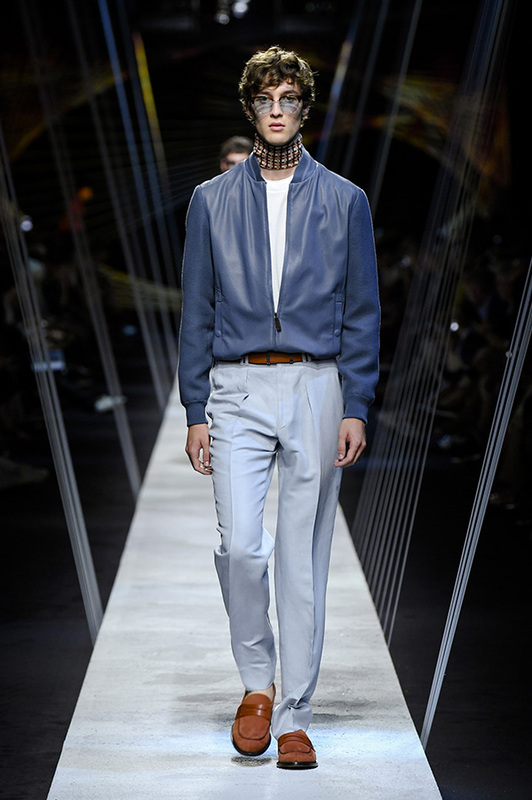 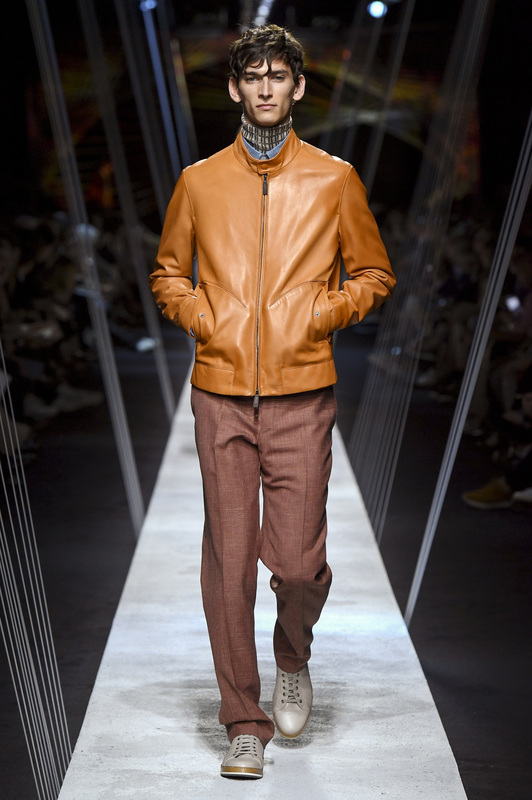 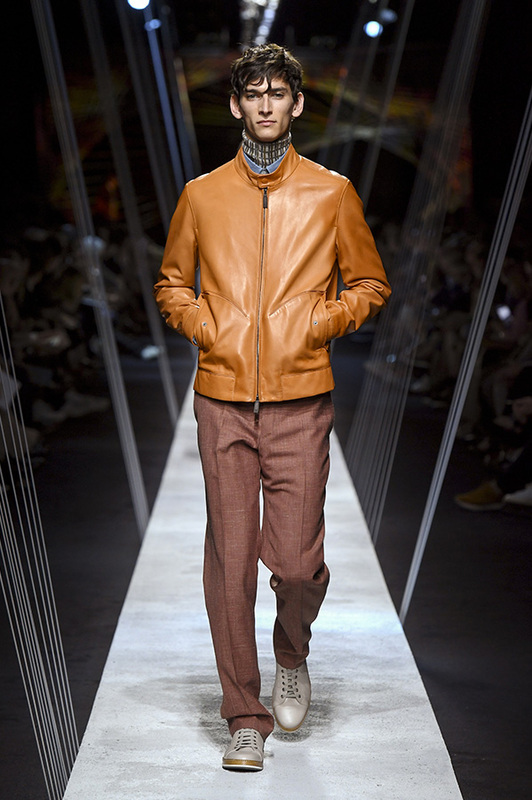 Reversible leather jacket with stand-up collar and piqué lining, pants with two reverse pleats, cotton-linen gauze neck scarf, perforated leather sneakers. 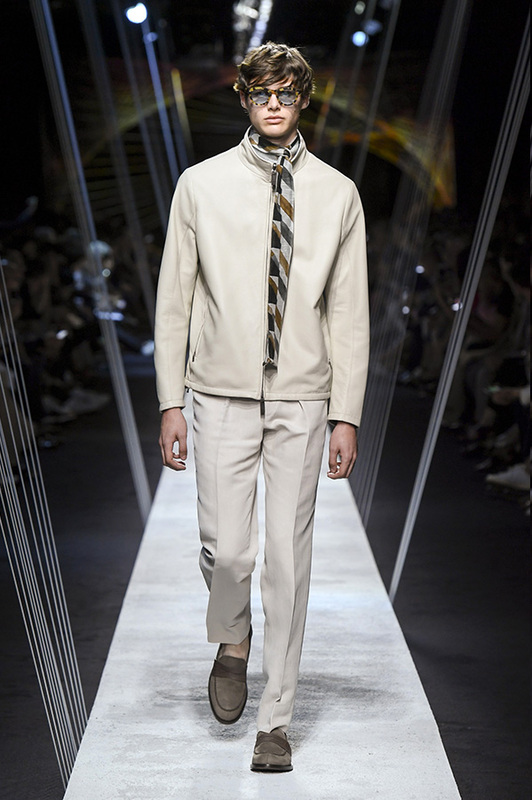 Field jacket with visible button closure, mercerized cotton T-shirt, flat front houndstooth pants, silk scarf with granite motif, belt bag with retractable handle, leather loafers with woven texture. 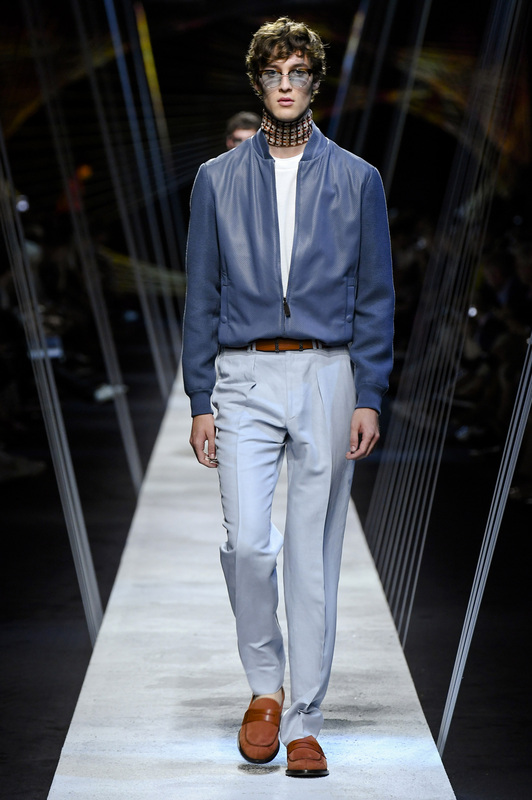 Soft leather jacket with stand-up collar, linen-cotton mélange shirt, cotton-linen gauze neck scarf, perforated leather sneakers. 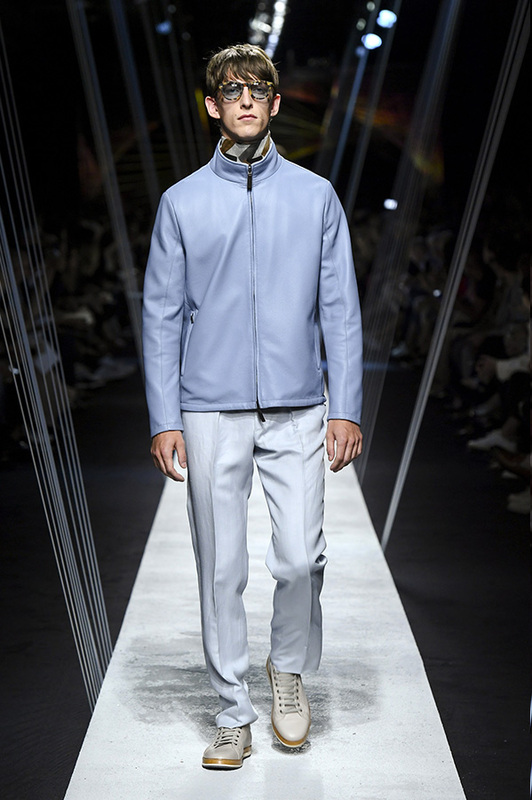 Kei jacket with applied pockets and waist-level pocket in micro terry-effect fabric, linen-cotton mélange shirt, flat front pants in malfilé fabric, leather single monk strap shoes with contrasting toe cap. 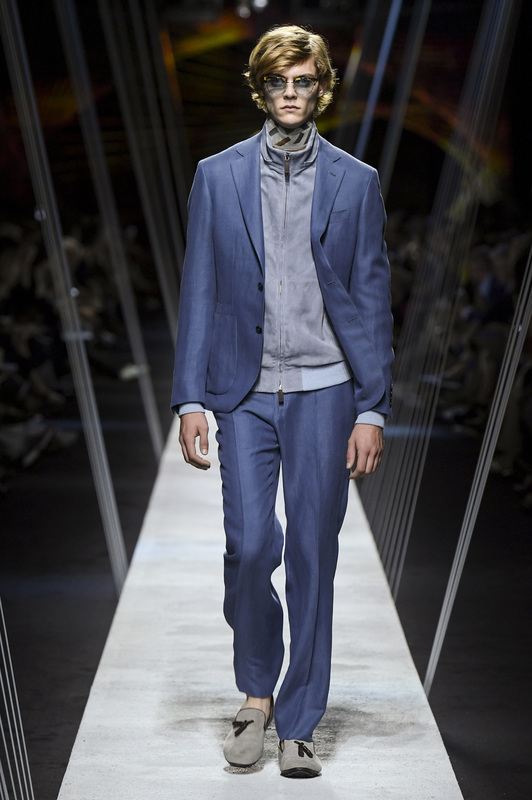 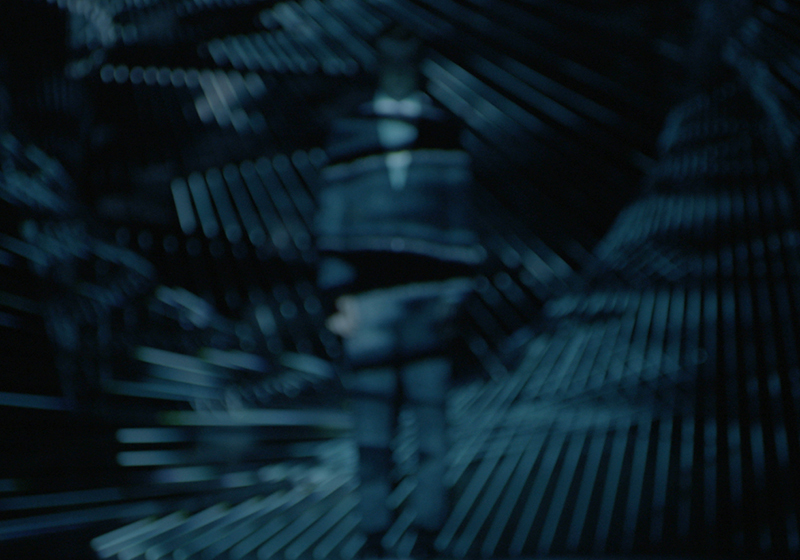 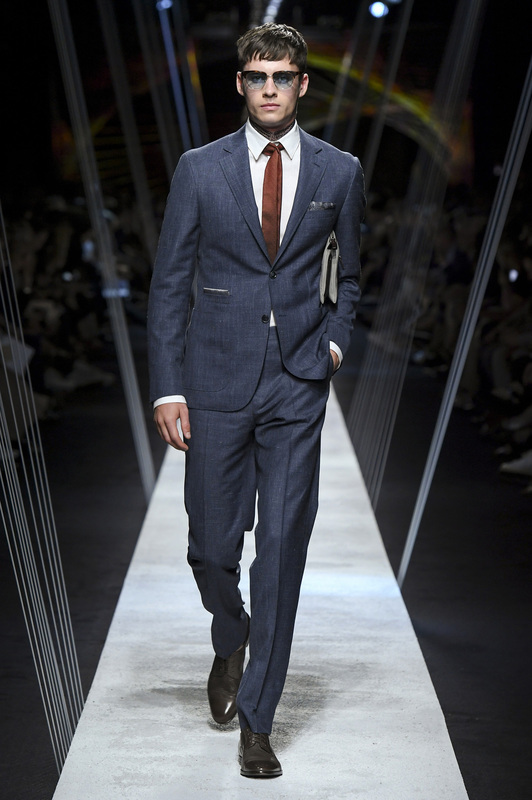 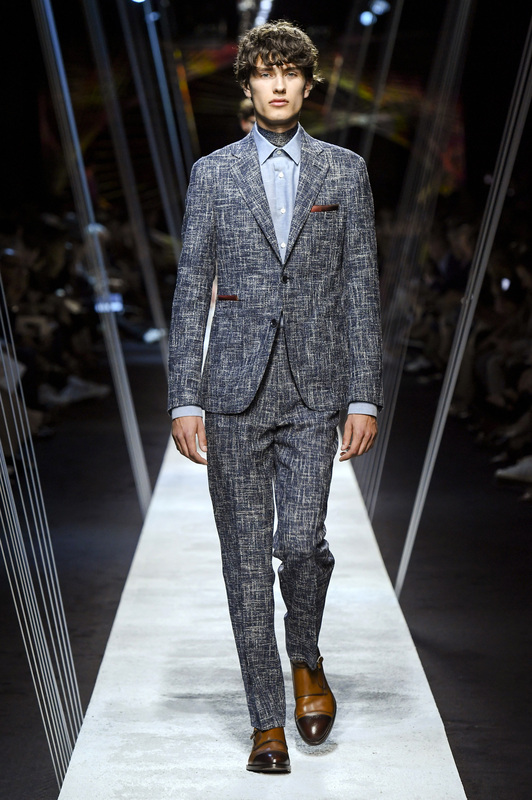 Kei suit consisting of double-breasted jacket with applied pockets and phone pocket and pants with two reverse pleats, two silk pocket squares, granite-effect scarf, leather derby shoes with woven texture. 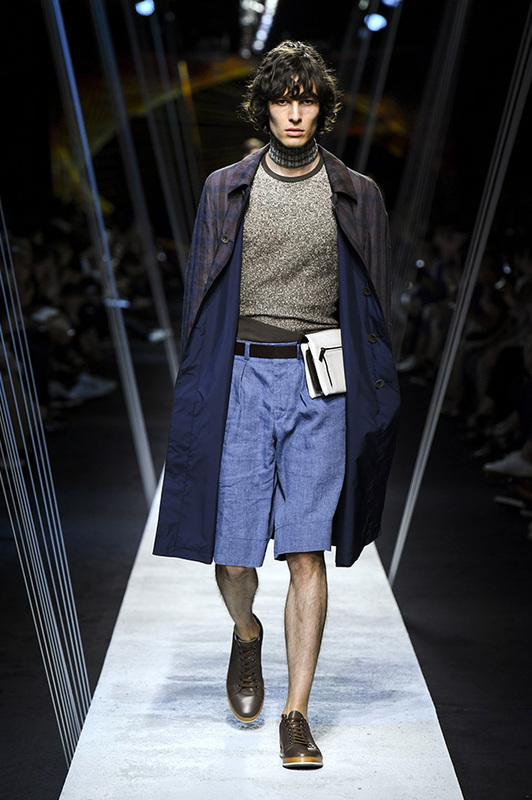 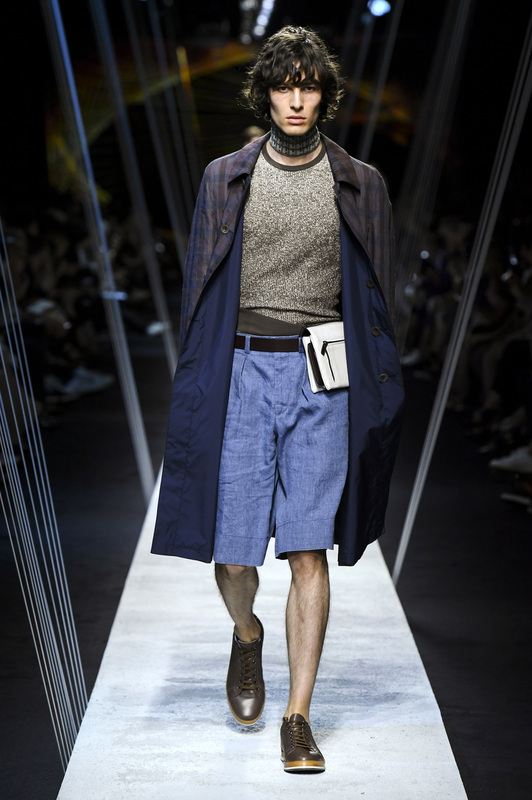 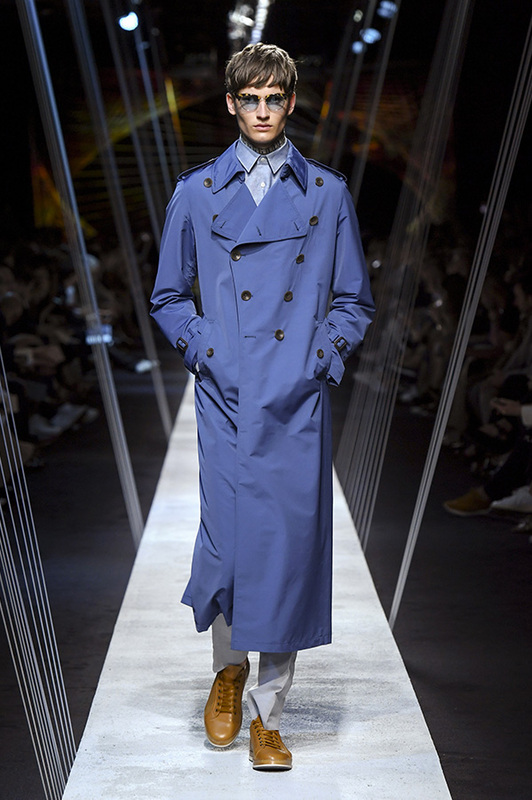 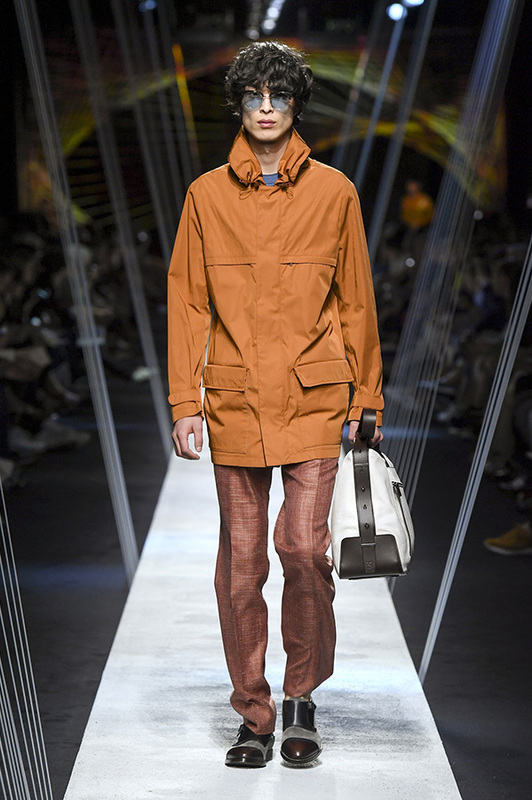 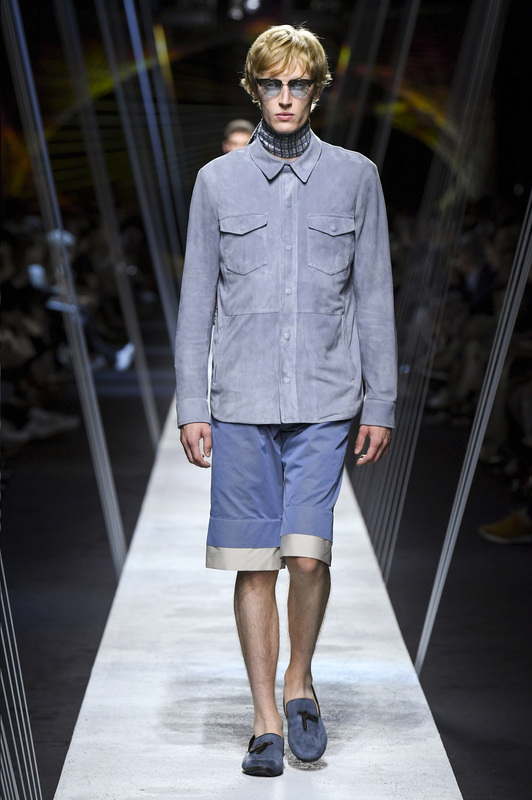 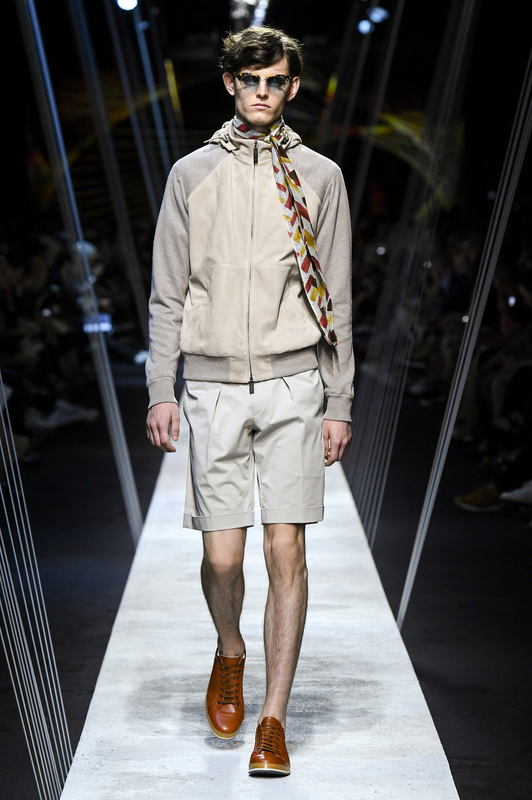 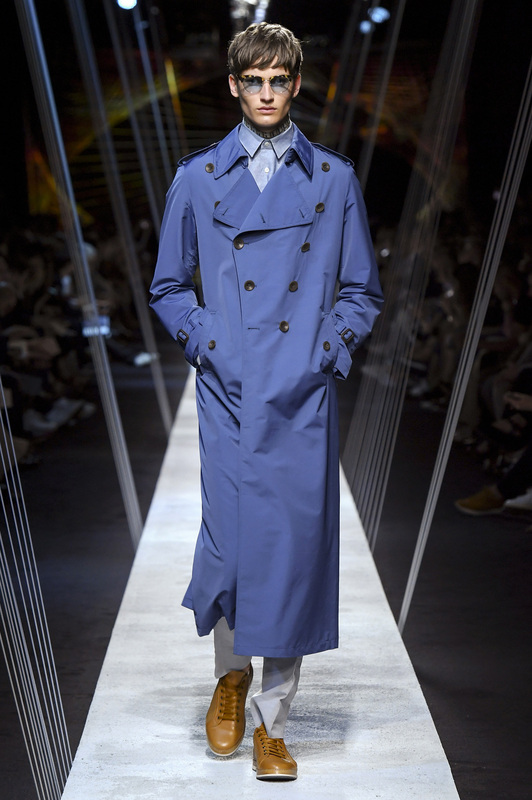 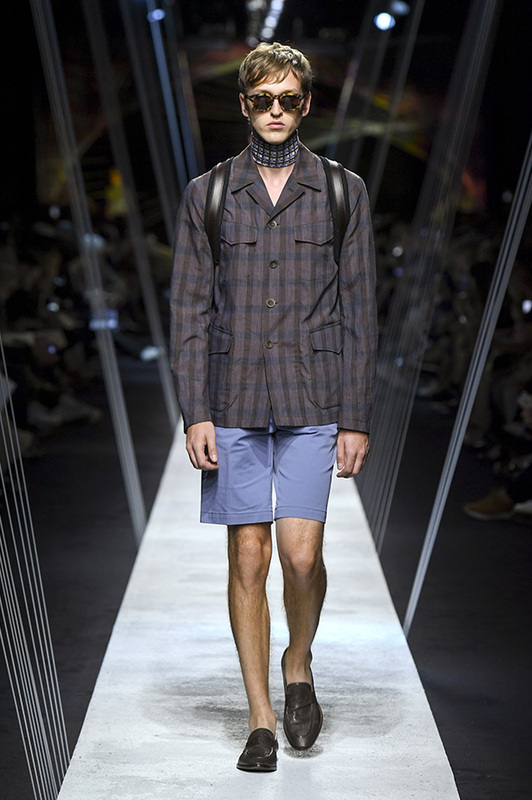 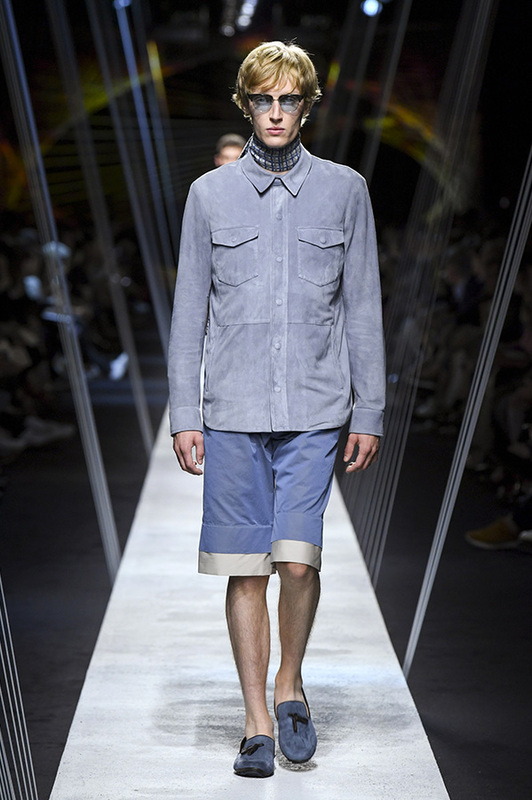 Reversible rain coat, two-tone jacquard polo shirt, single-pleated Bermuda shorts, tumbled calfskin belt bag with retractable handle, perforated leather sneakers. 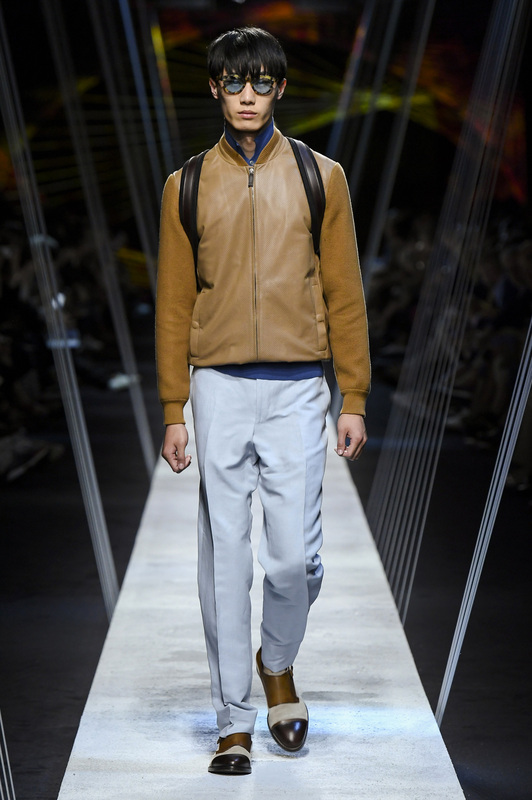 Reversible sheepskin jacket, mercerized cotton T-shirt, flat front wool-silk-linen pants with tatami effect, cotton-linen gauze neck scarf, suede monk strap shoes with contrasting toe cap. 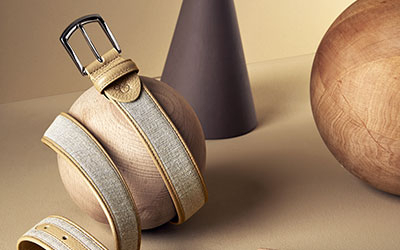 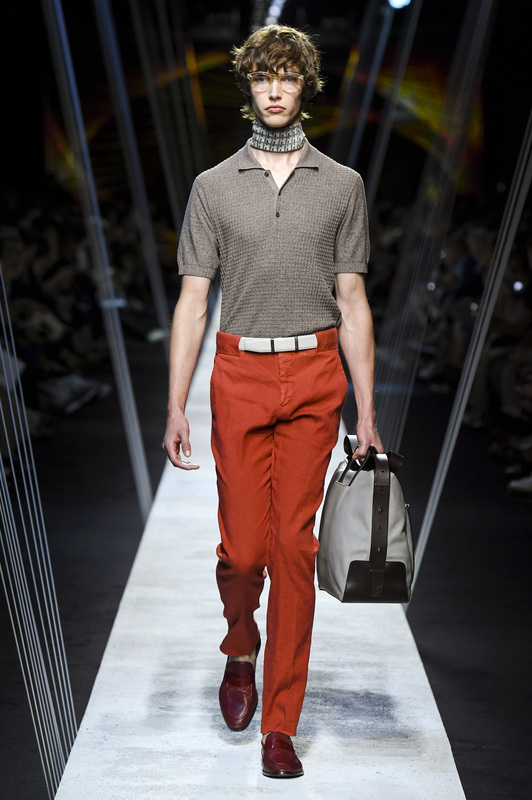 Cotton polo shirt, pants with wide belt loops, calfskin belt, cotton-linen gauze neck scarf, carryall in tumbled calfskin with retractable handle, calfskin loafers with woven texture. 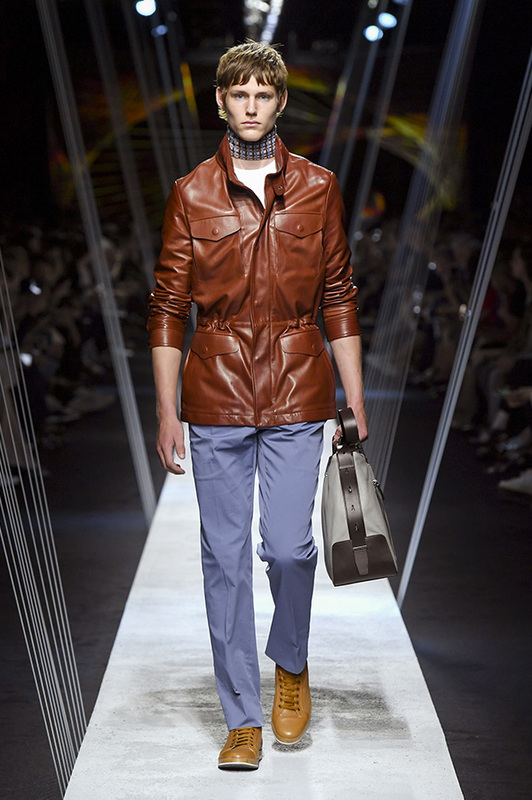 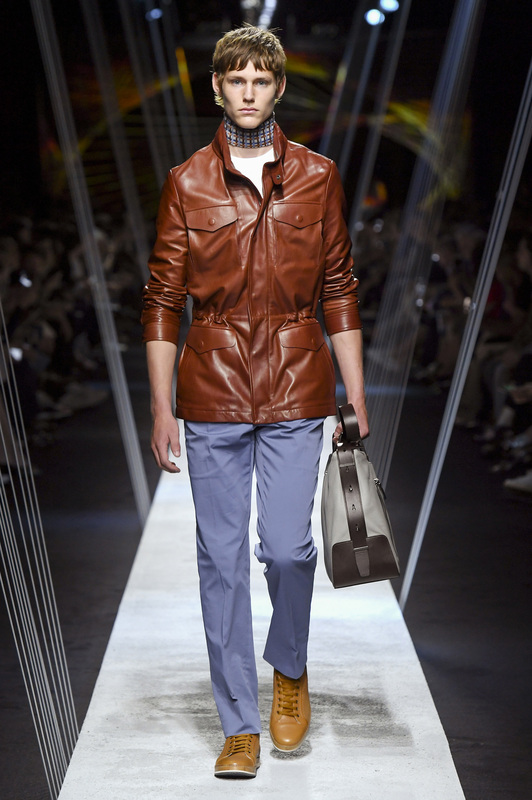 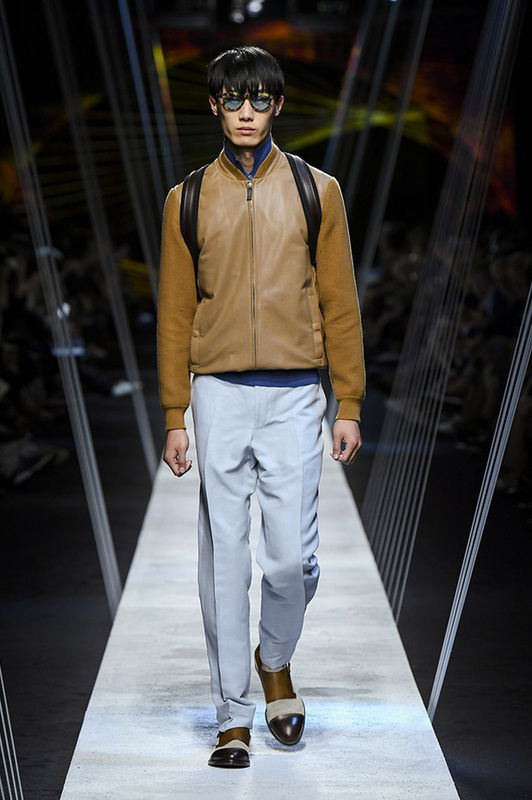 Perforated nappa leather jacket with knit sleeves, flat front pants with slant pockets, tumbled calfskin backpack with retractable handle, suede single monk strap shoe with contrasting toe cap. 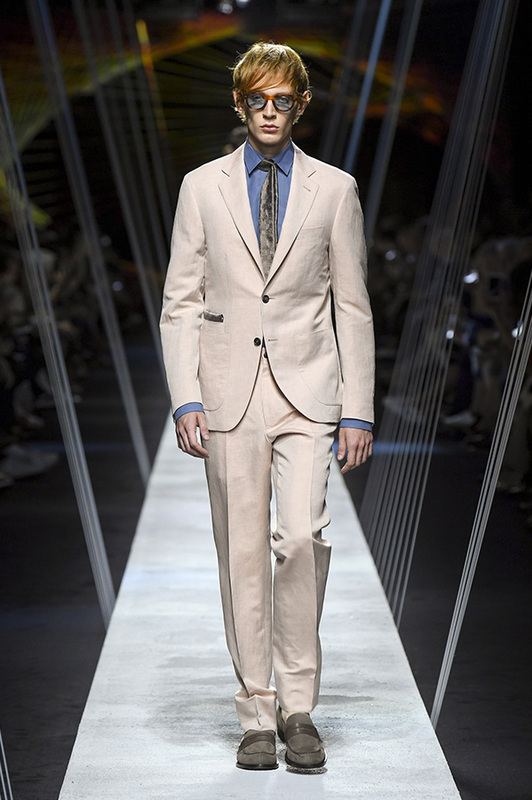 Kei suit with patch pockets and waist pocket, suede leather jacket with zip and stand-up collar, silk-linen gauze neck scarf, suede loafers with tassels. 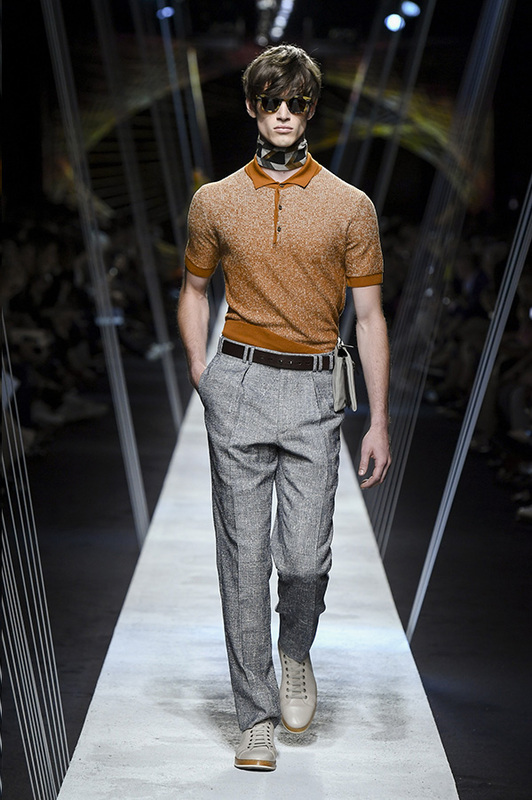 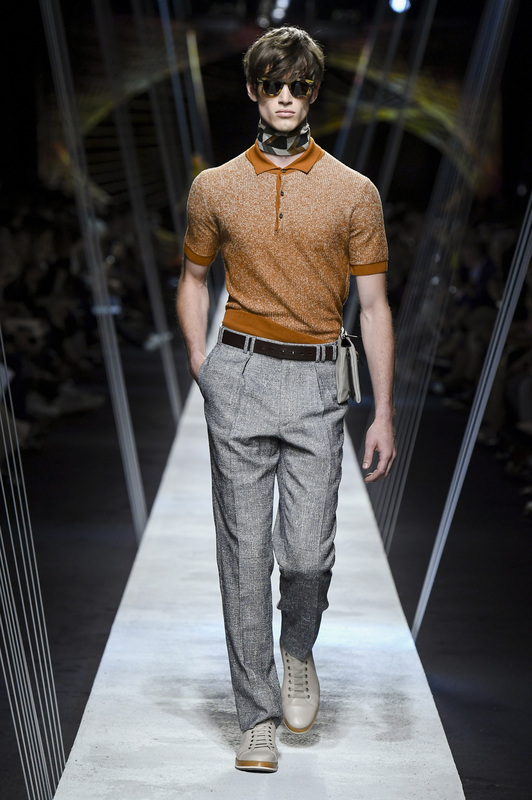 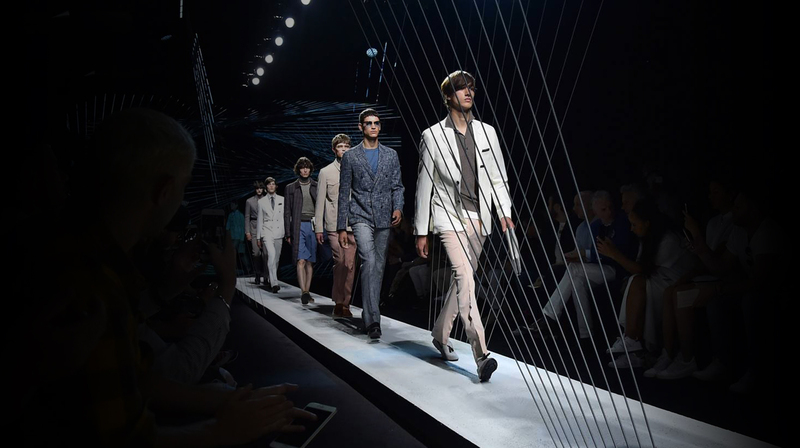 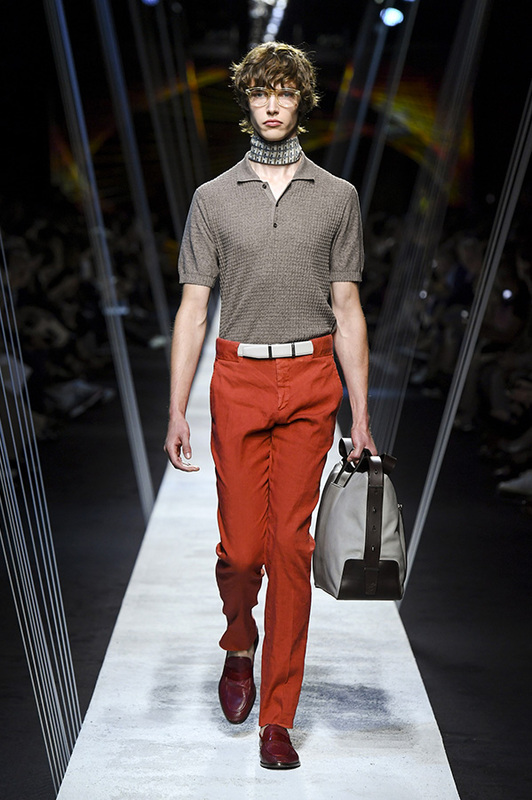 Two-tone jacquard polo shirt with marbled effect, pants in malfilé fabric with two reverse pleats, cotton-linen gauze neck scarf, belt bag with retractable handle, perforated leather sneakers. 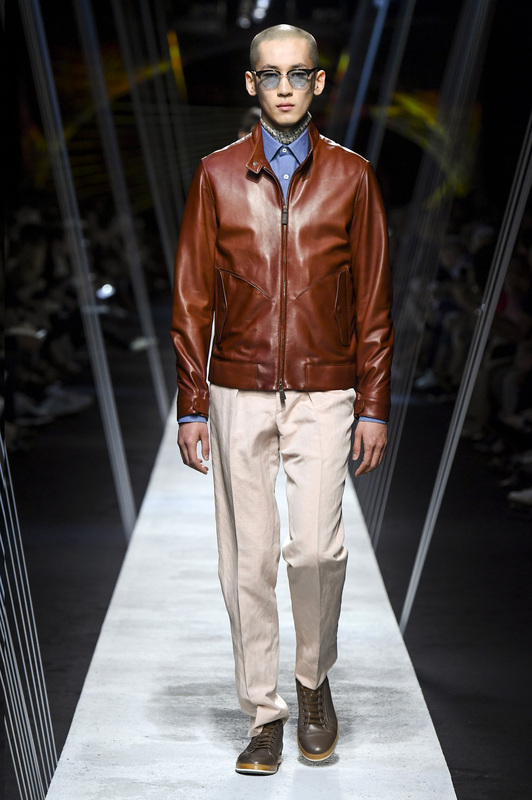 Perforated nappa leather jacket, mercerized cotton T-shirt, pants with two reverse pleats, cotton-linen gauze scarf, nubuck loafers with contrasting band. 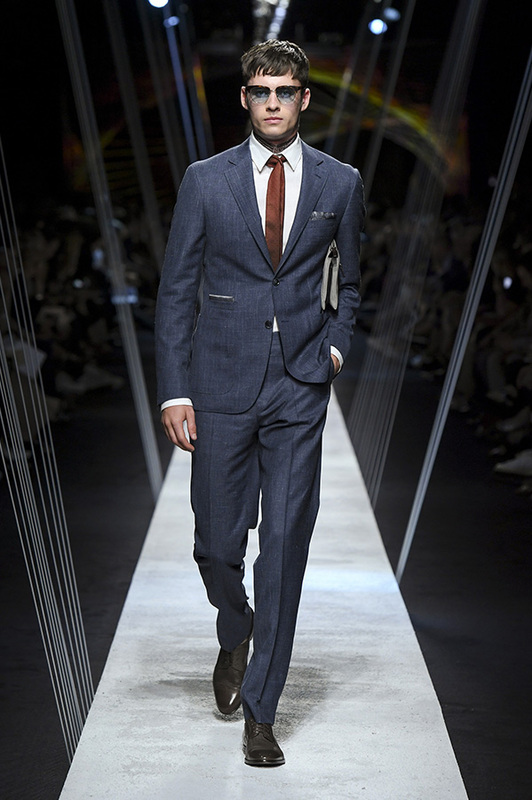 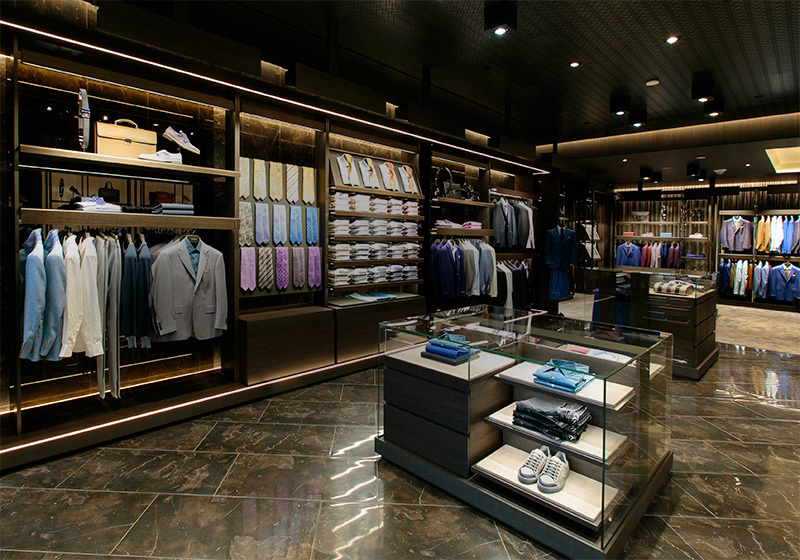 Wool-silk-linen Kei suit consisting of jacket with applied pockets and waist pocket and flat front pants, pure linen shirt, neck scarf used as a tie, silk pocket square and scarf, pouch with retractable handle, calfskin derby shoes with woven texture. 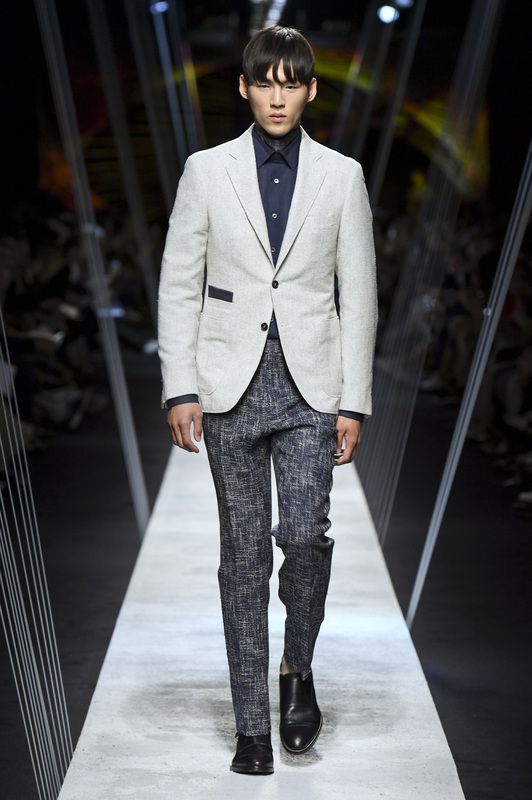 Kei suit in malfilé fabric consisting of jacket with waist pocket and flat front pants, cotton shirt, leather single monk strap shoe. 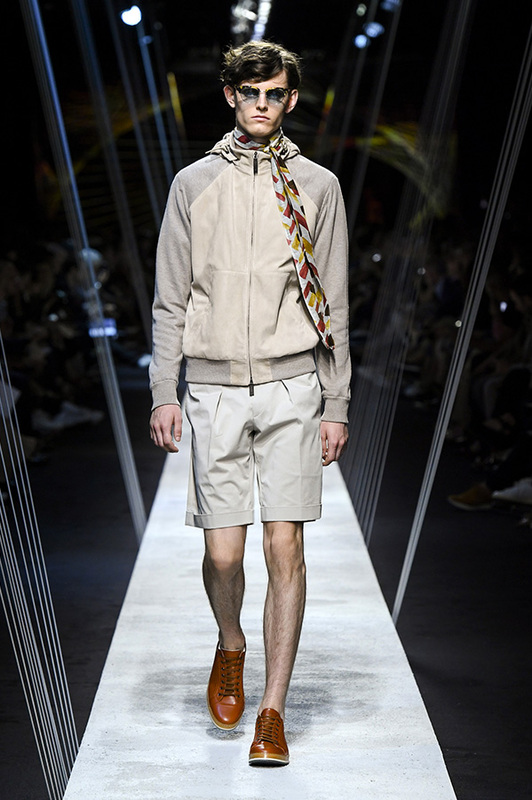 Suede jacket with hood and knit sleeves, mercerized cotton T-shirt, single-pleated Bermuda shorts, cotton-linen gauze neck scarf, calfskin belt with two metal loops, perforated leather sneakers. 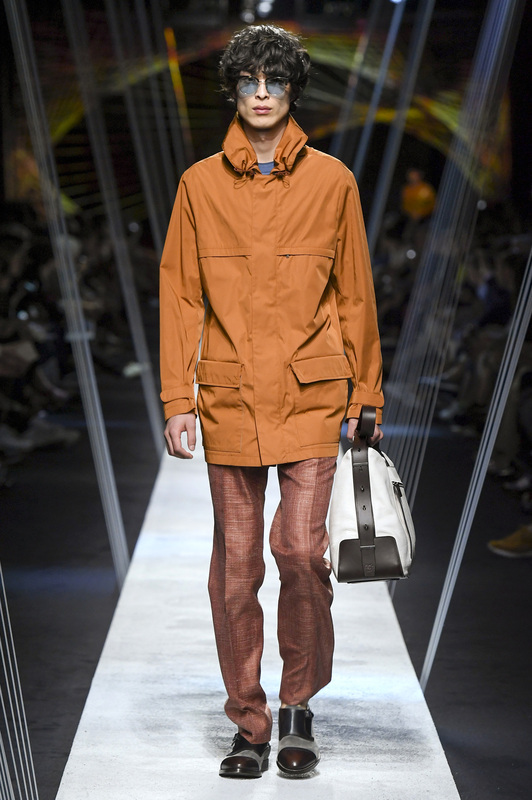 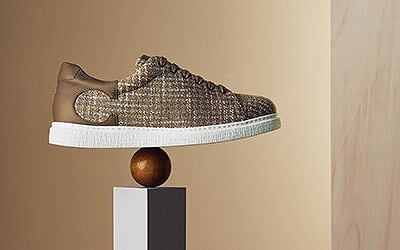 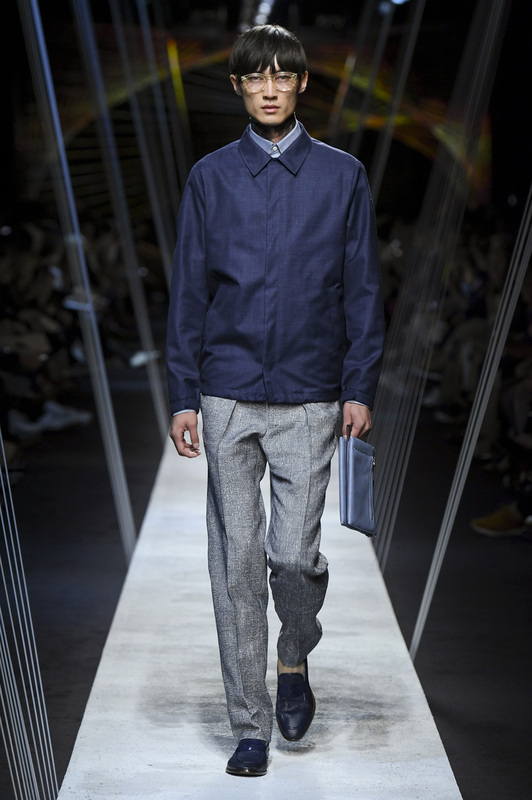 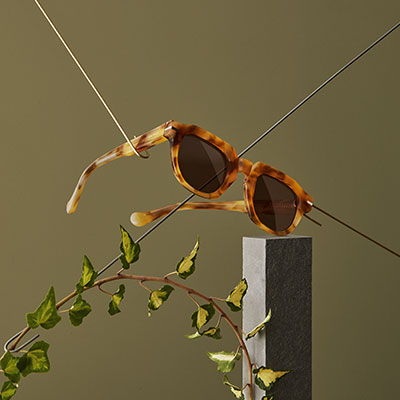 Jacket in technical fabric with fold-away hood, pants in wool-silk-linen with tatami effect, carryall in tumbled calfskin with retractable handle, suede single monk strap shoes with contrasting toe cap. 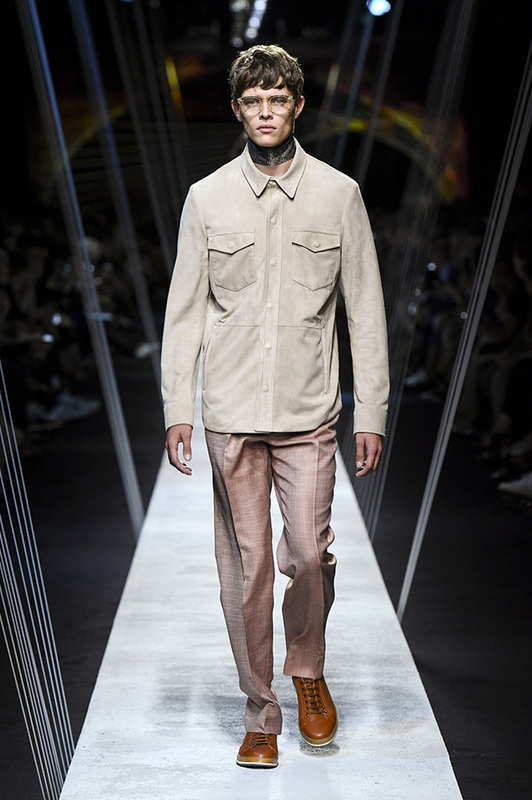 Madras field jacket with button closure, Bermuda shorts with wide belt loops, cotton-linen gauze neck scarf, tumbled calfskin backpack, leather loafers with woven texture. 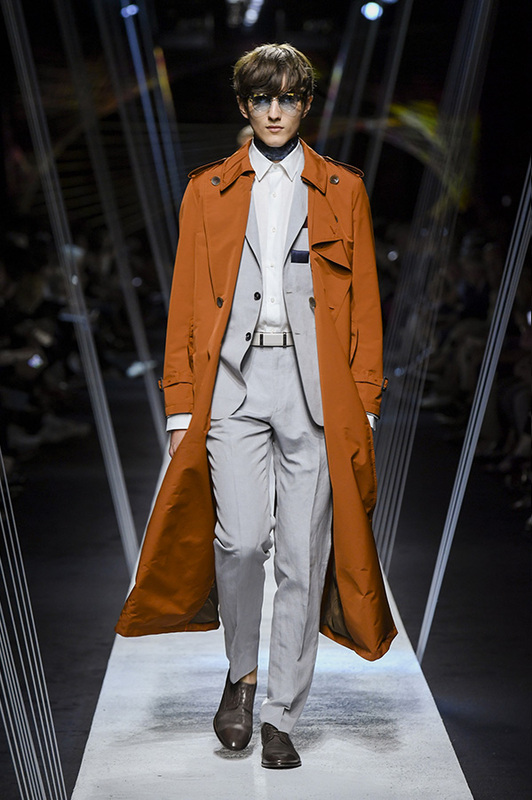 Long double-breasted trench coat, linen-cotton mélange shirt, flat front pants with slant pockets, cotton-linen gauze neck scarf, perforated leather sneakers. 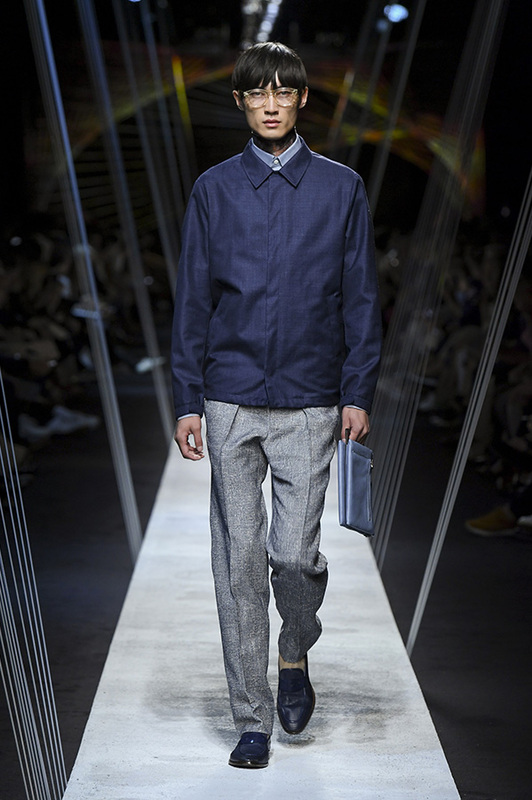 Kei jacket with applied pockets and small pocket within the right pocket, pants in malfilé fabric, cotton polo shirt, silk pocket square, leather monk strap shoes with contrasting toe cap. 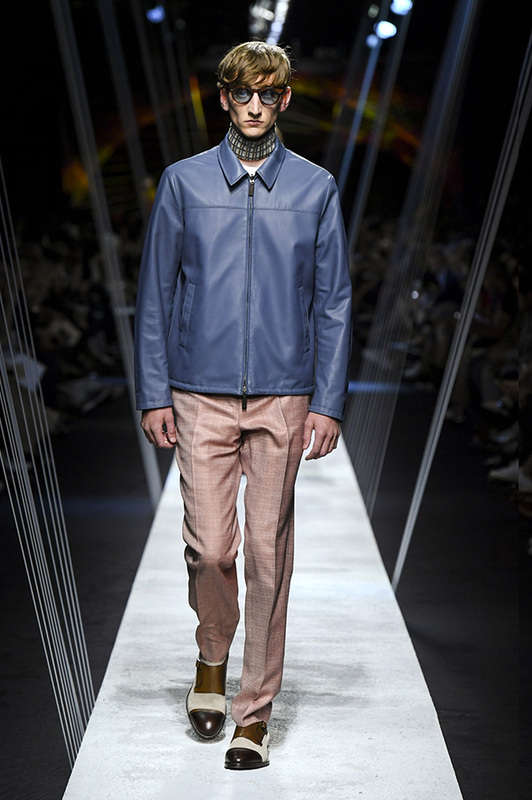 Soft leather jacket with stand-up collar and zip, linen shirt, silk scarf with geometric motif, flat front pants in wool-silk-linen, perforated leather sneakers. 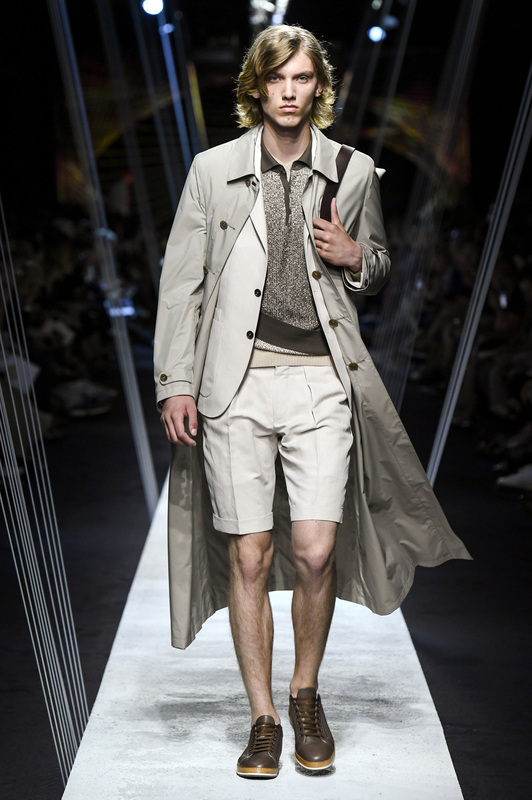 Goatskin overshirt with hidden closure, mercerized cotton T-shirt, linen-silk Bermuda shorts, cotton-linen gauze neck scarf, loafers with tassels. 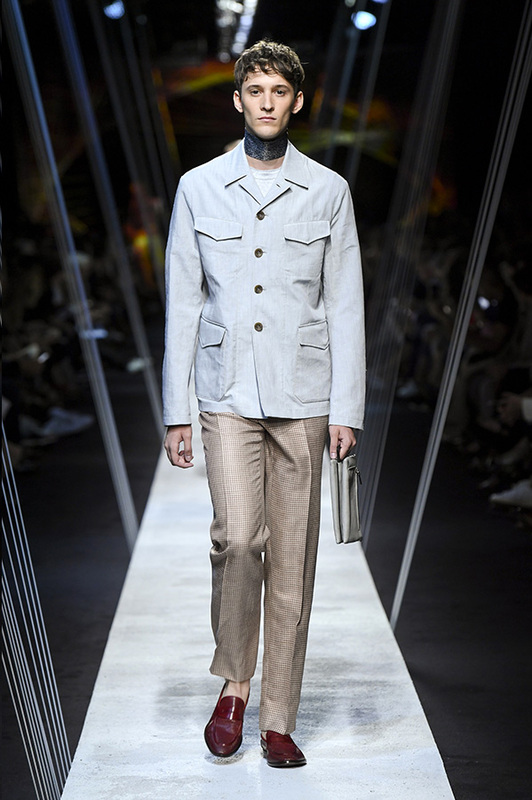 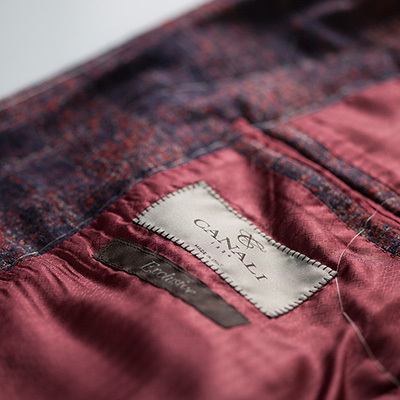 Kei suit consisting of patch pockets and double pockets at chest, pants with two reverse pleats, suede leather jacket with zip, silk scarf, loafers with woven texture. 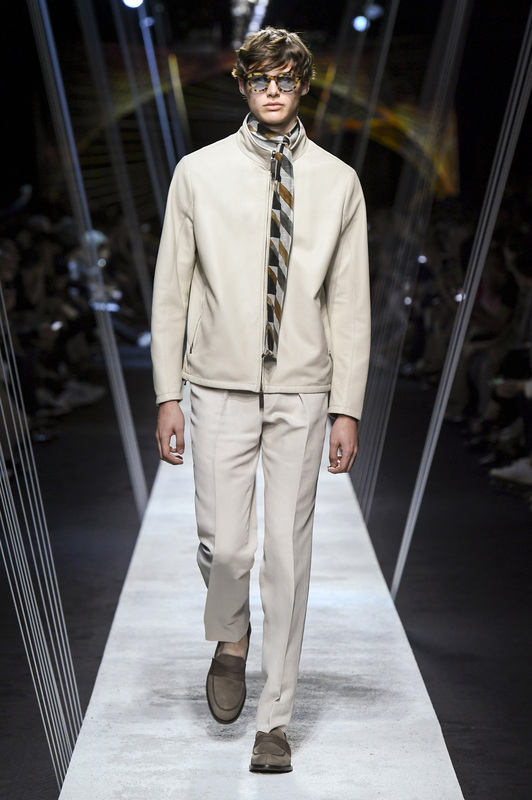 Jacket with shirt collar and hidden closure, pants with two reverse pleats, neck scarf used as tie, art deco-style scarf, small bag with retractable handle, leather loafers with woven texture. 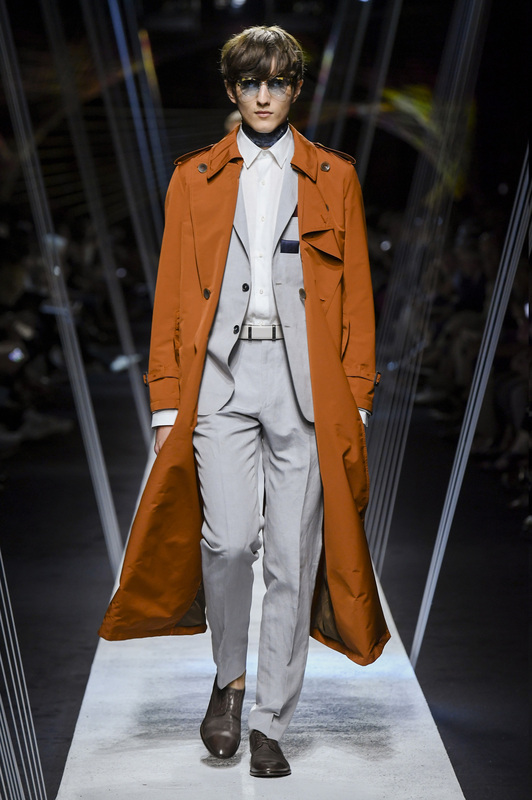 Long double-breasted trench coat, Kei suit consisting of jacket with double chest pockets and pants with two reverse pleats, pure linen shirt, two silk pocket squares, calfskin derby shoes with woven texture. 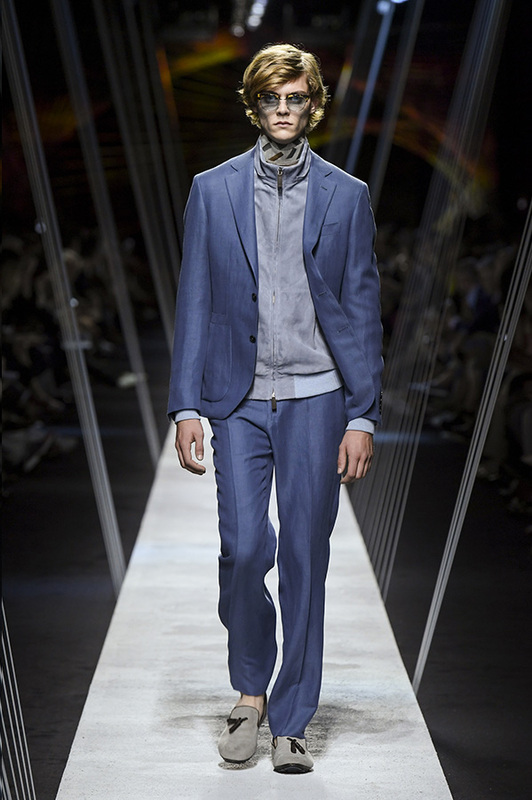 Tuxedo jacket in malfilé fabric with contrasting silk shawl lapels and piping, cotton shirt, flat front pants in wool-silk with denim effect, neck scarf used as tie, leather evening loafers. Tuxedo jacket in malfilé fabric with shawl lapels and piping, cotton shirt, flat front pants in wool-silk with denim effect, granite effect scarf, leather evening loafers.